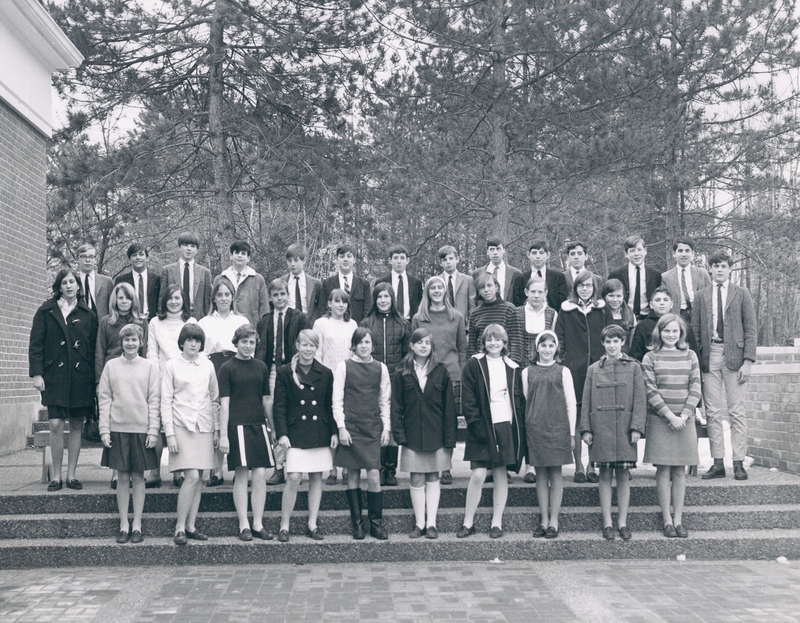 PDS 1 The class of 1966 poses as MFS sophomores by the Battle Monument. 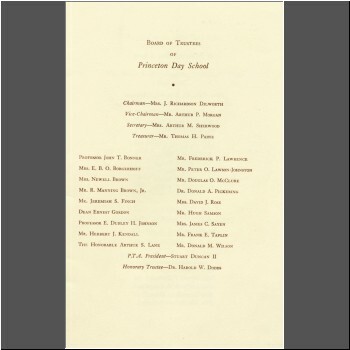 The girls entered PDS as seniors and became the first class to graduate from the new school. 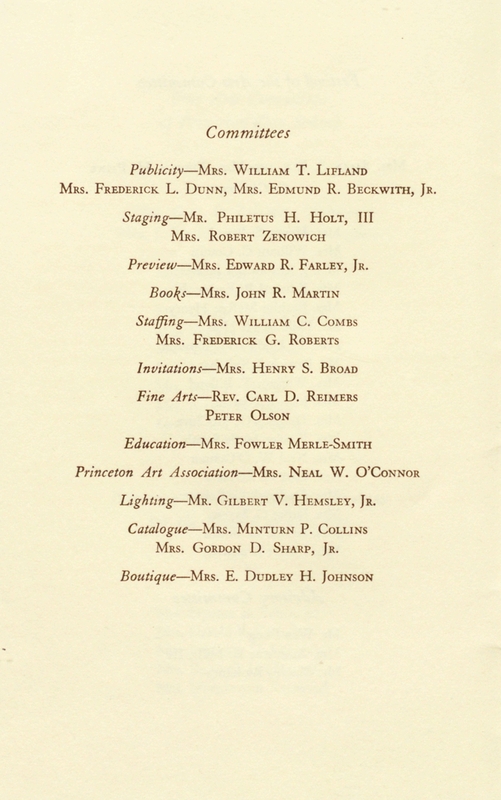 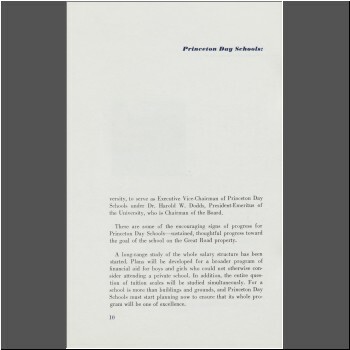 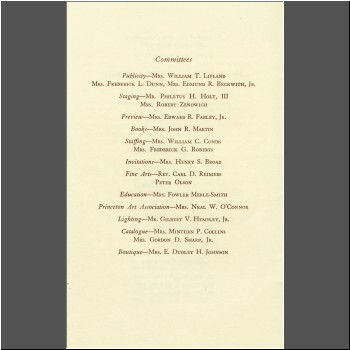 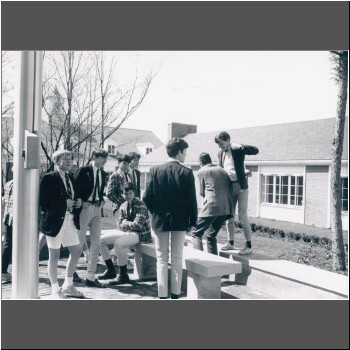 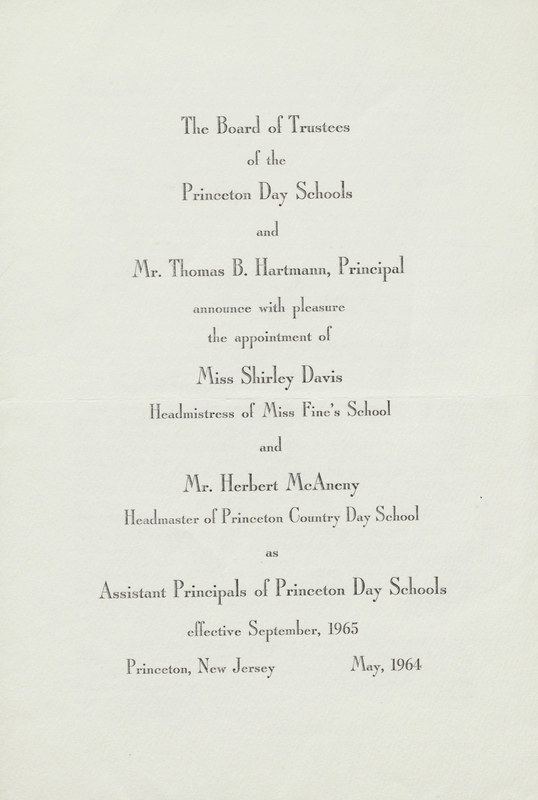 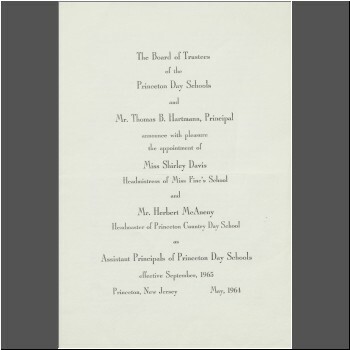 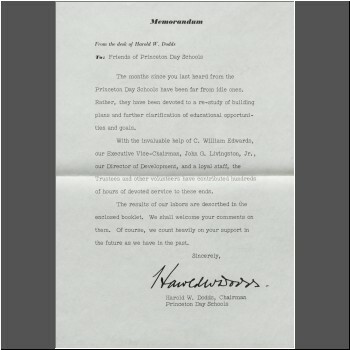 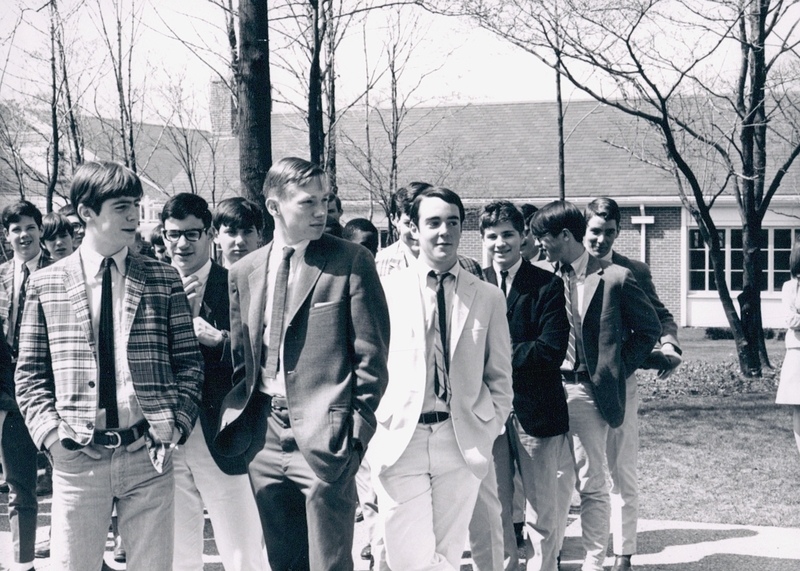 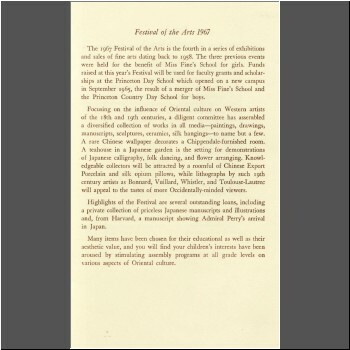 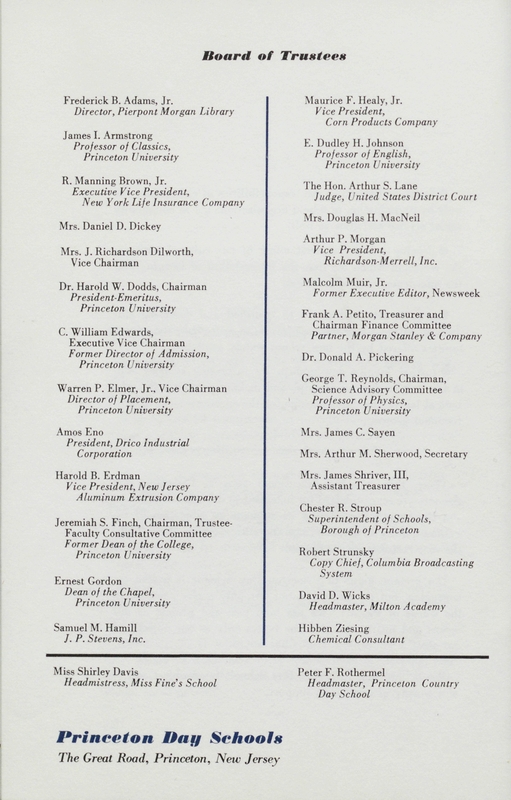 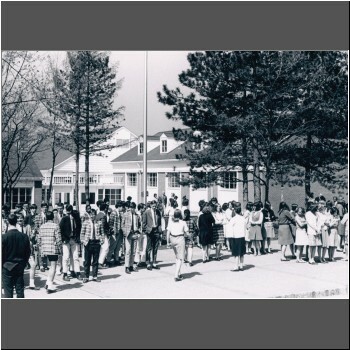 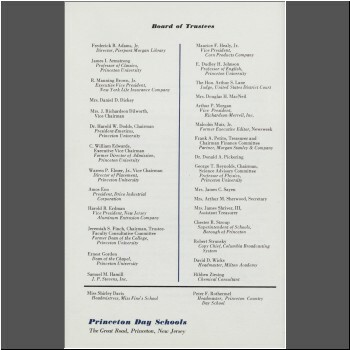 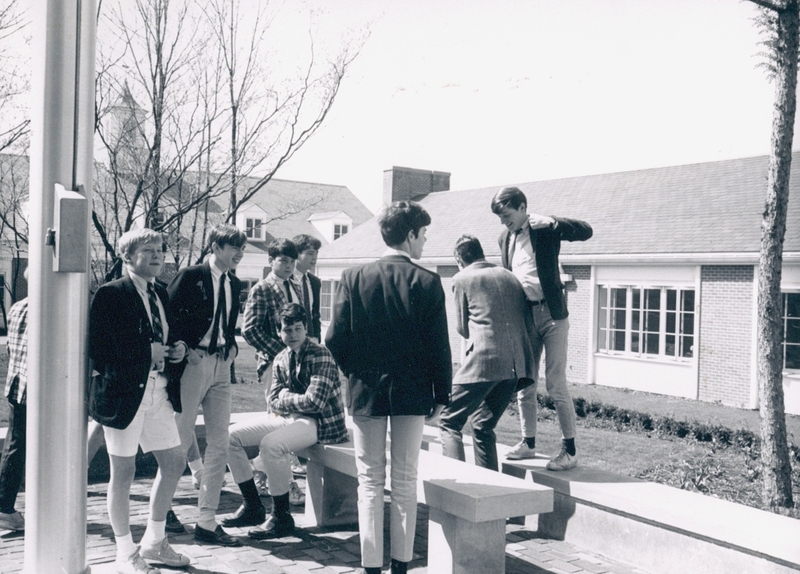 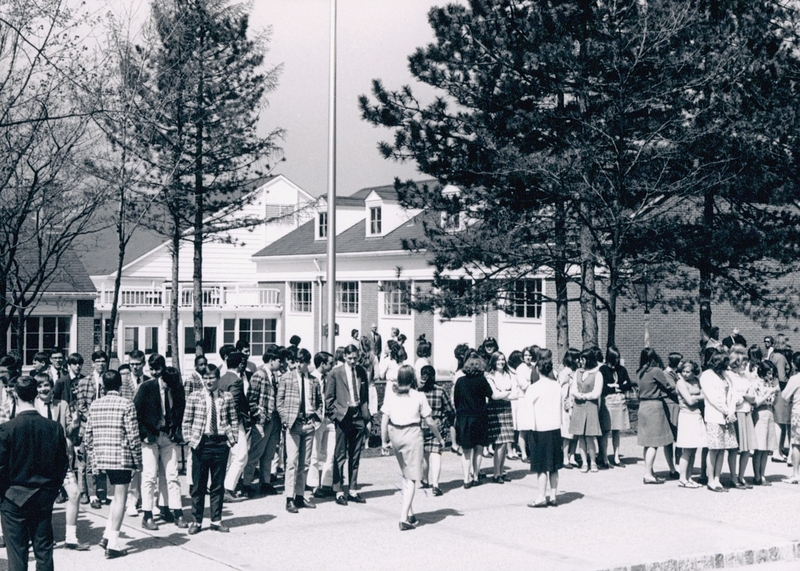 Since boys were enrolled only through ninth grade at PCD, it was not until 1968 that PDS had a coed commencement. 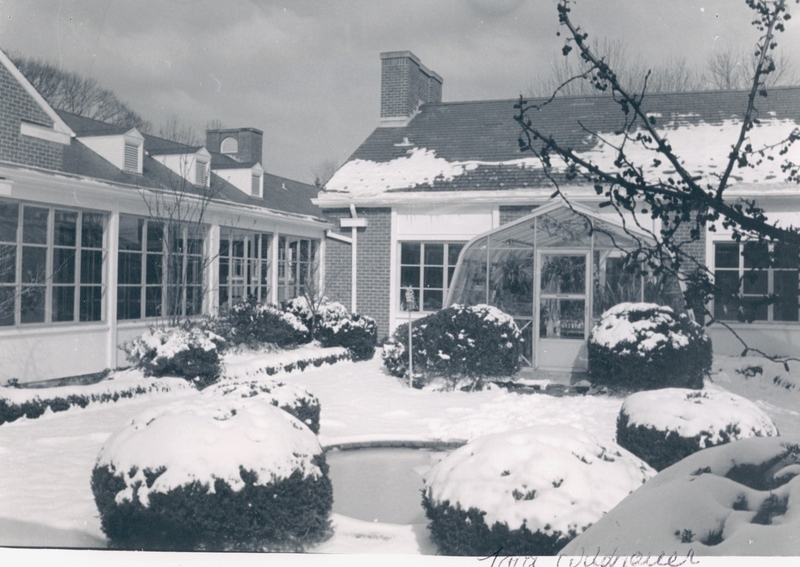 PDS 33 The greenhouse, donated in memory of Margaret (Penny) Wallace '69, and the original Anne Reid '72. 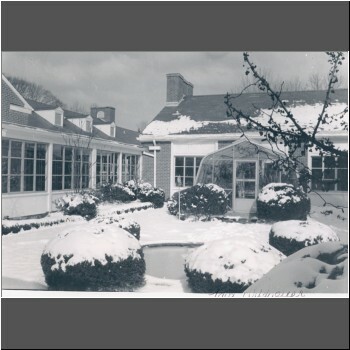 Art Gallery opened into a courtyard with a pond in the center. 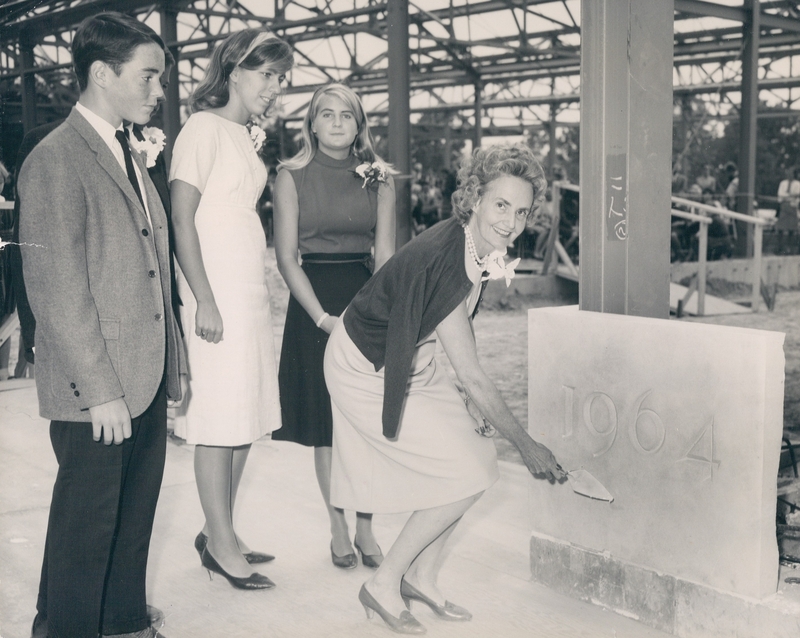 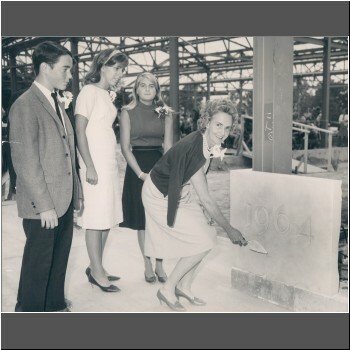 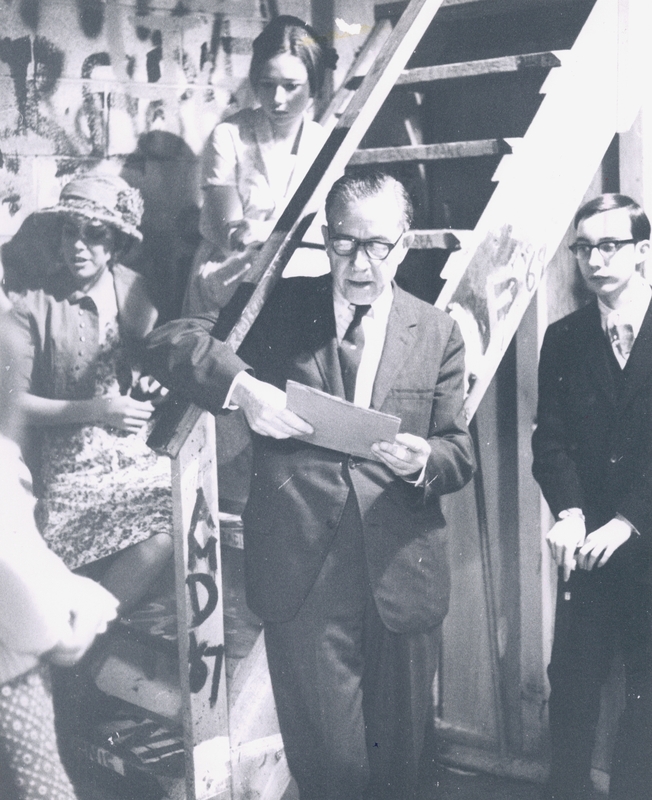 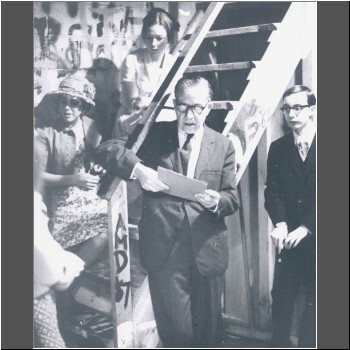 PDS 34 On September 24, 1964, newly elected Board Chair Elizabeth C. (Bunny) Dilworth puts the finishing touches on the school's cornerstone while Sandy Wandelt, Sally Tomlinson and Molly Dorf, students from the last class to graduate from the founding schools, look on. 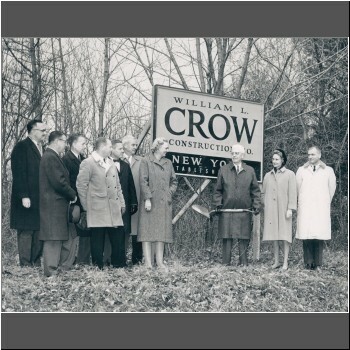 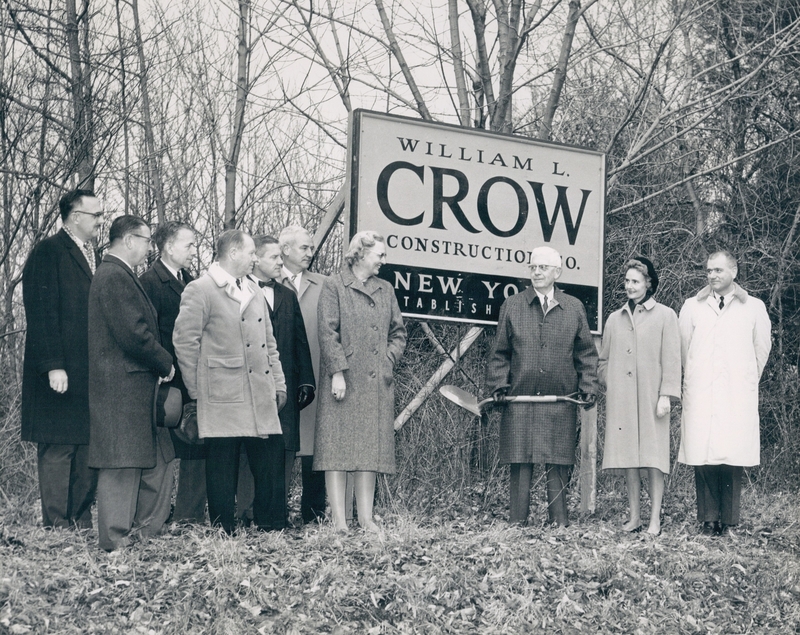 PDS 35 Harold W. Dodds, Chairman of the PDS Board of Trustess, prepares to break ground for the new school joined by (from left) architect Philip Bontherton, President of Crow Construction William Crow, PCD Headmaster Herbert McAneny, and trustees Amos Eno, Warren Elmer, C. Williams Edwards, MFS Headmistress Shirley Davis, Vice Chair of the Board Bunny Dilworth and PDS Principal Thomas Hartmann. 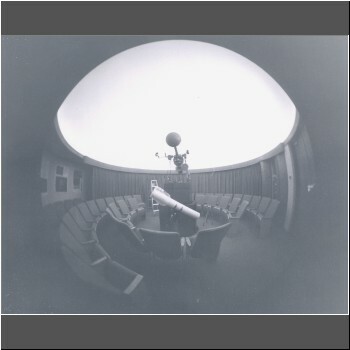 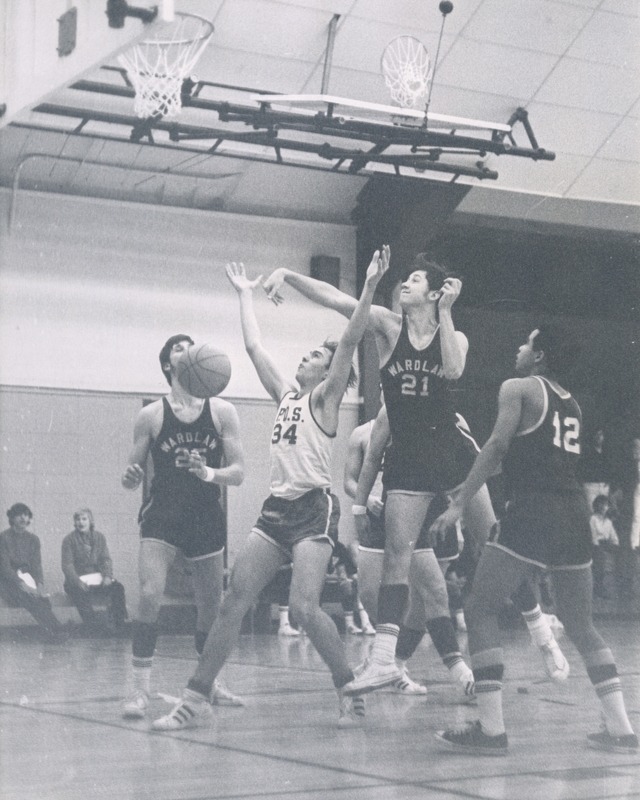 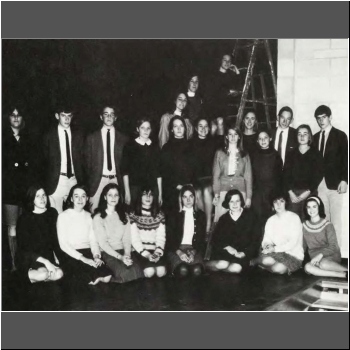 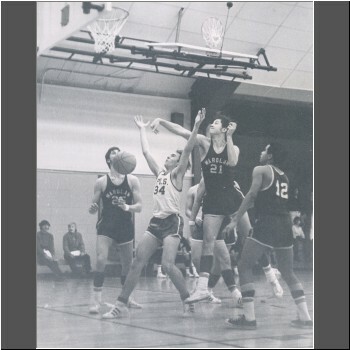 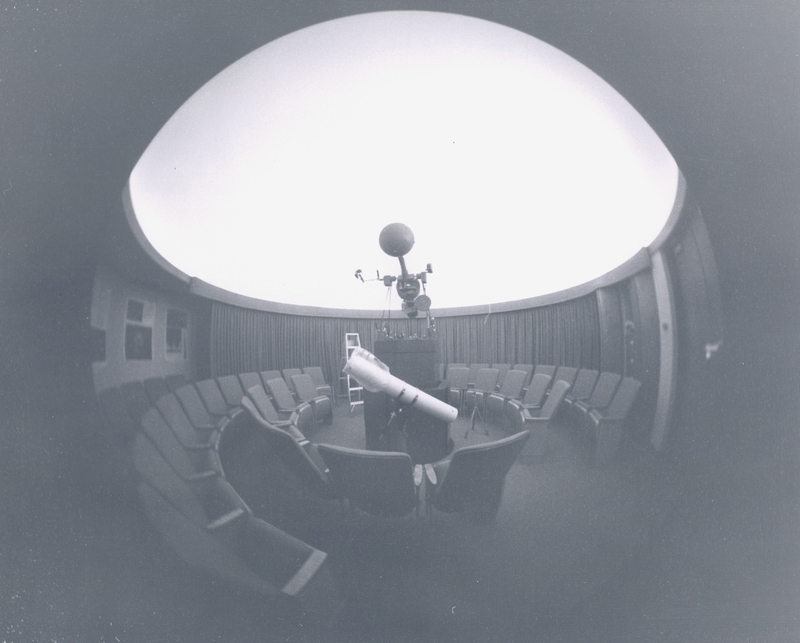 PDS 38 A planetarium was donated in memory Stuart Duncan '72. 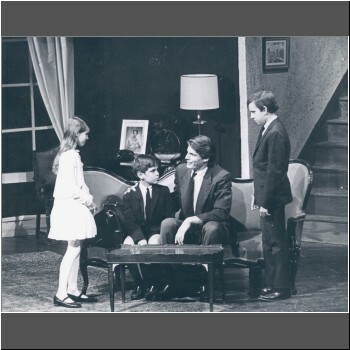 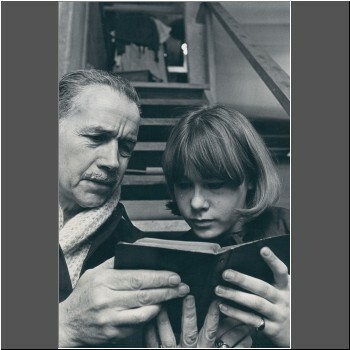 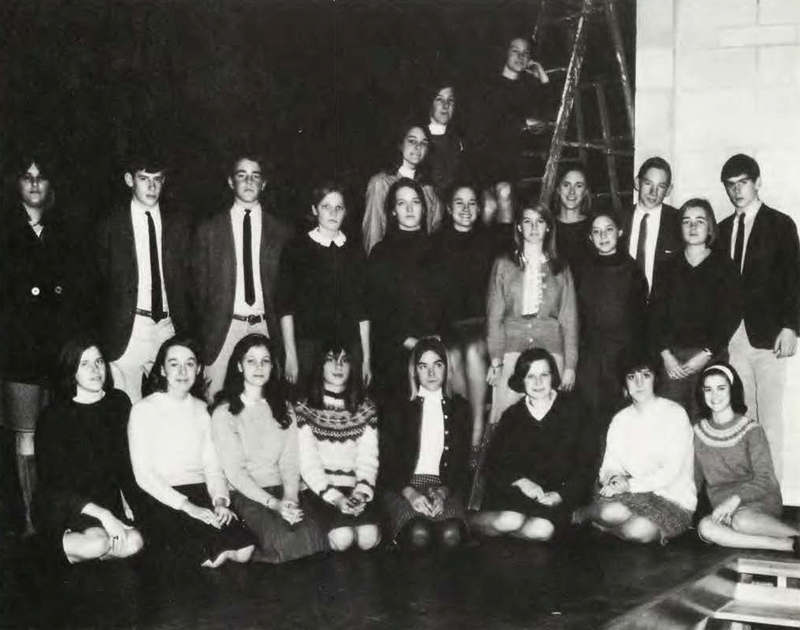 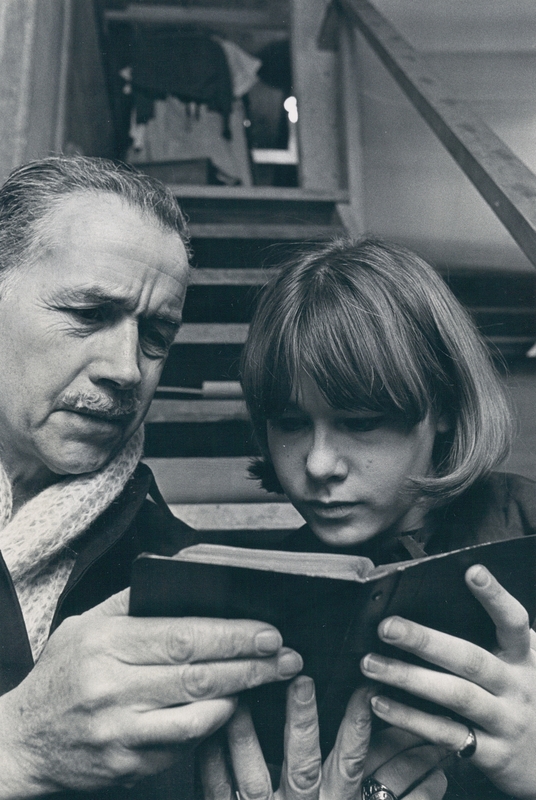 PDS 44 Herbert McAneny and Molly Hall '69 in one of the first PDS dramatic productions, The Diary of Anne Frank, 1966. 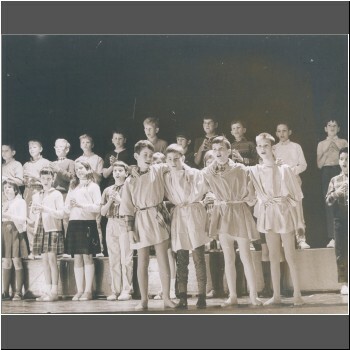 PDS 45 Herbert McAneny coaches students for a PDS performance. 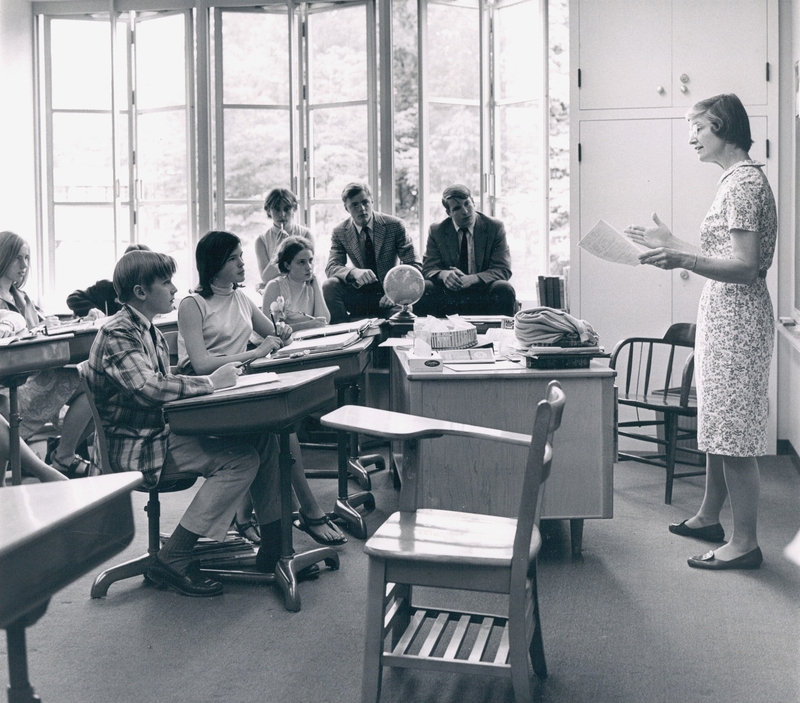 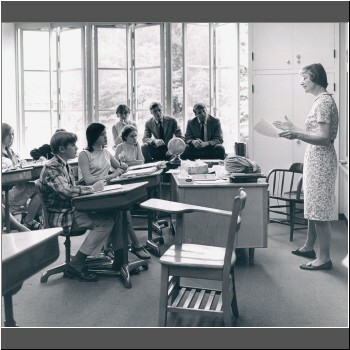 PDS 46 Jean Whitall conducts a freshman math class in 1967. 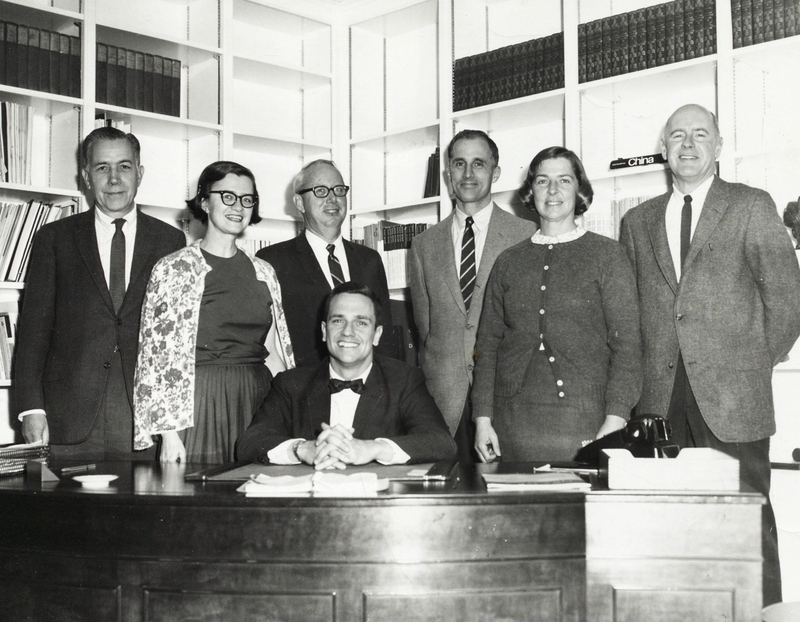 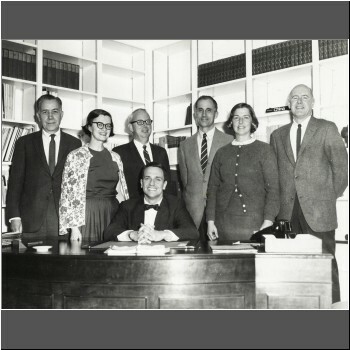 PDS 47 The 1966-1967 administration: Head of Upper School Herbert McAneny, Administrative Assistant Beverly Williams, Business Manager Carl Storey, Headmaster Doug McClure (seated), Head of Middle School Mike Merle-Smith, Head of Lower School Madeline Weigel and Director of Admissions Wes McCaughan. 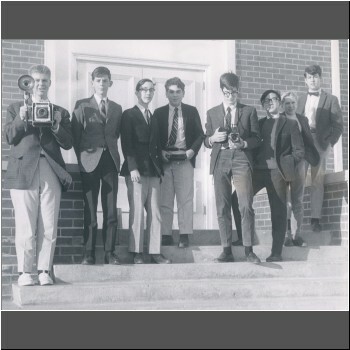 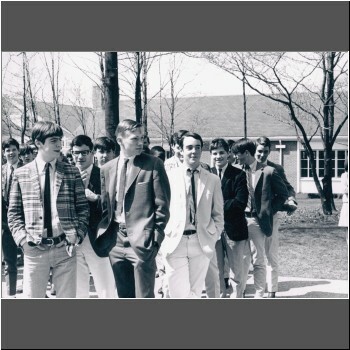 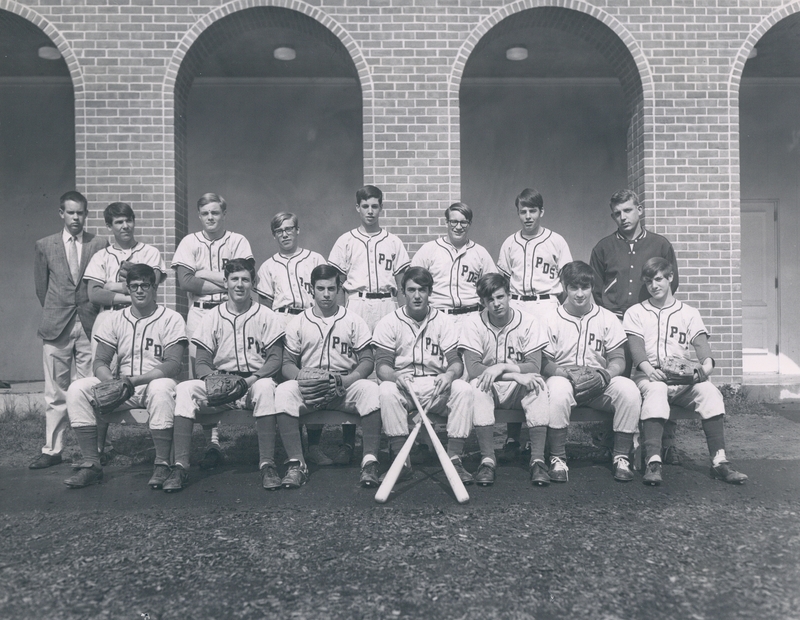 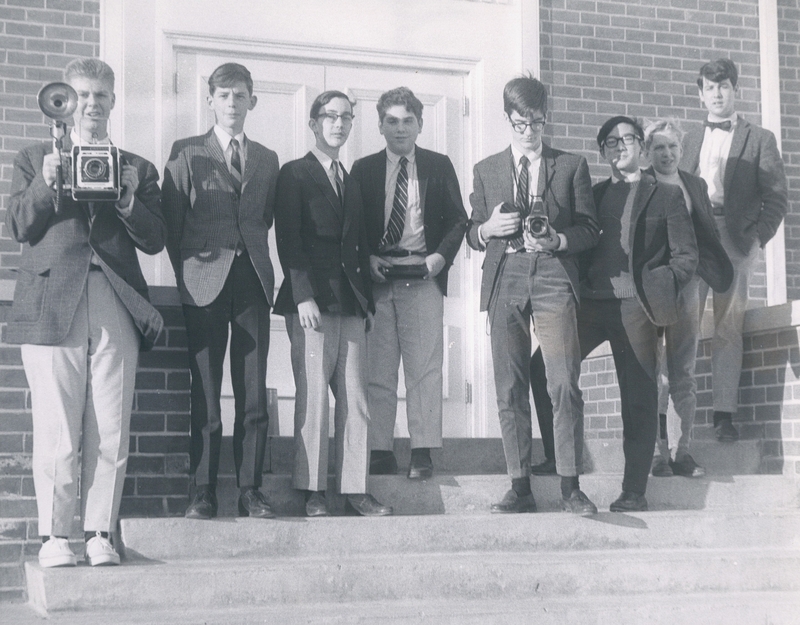 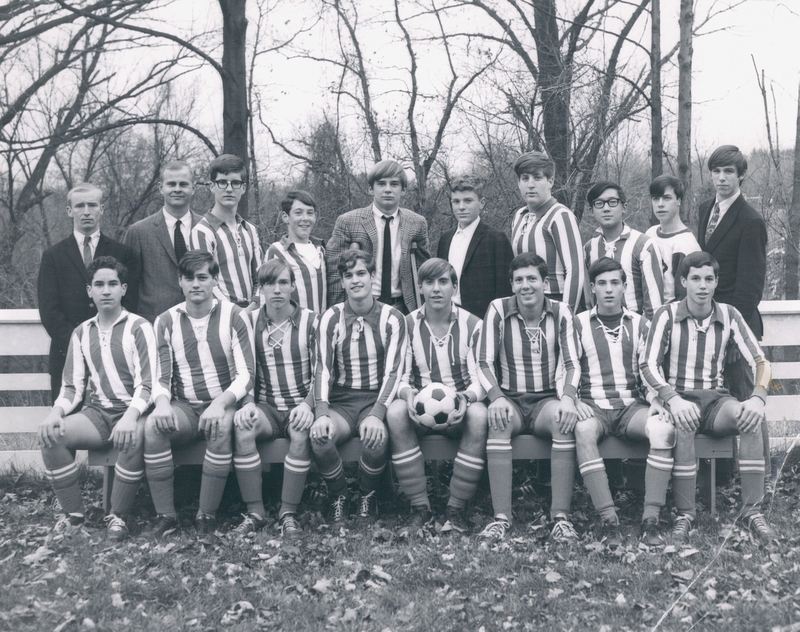 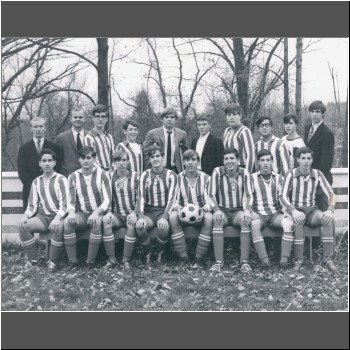 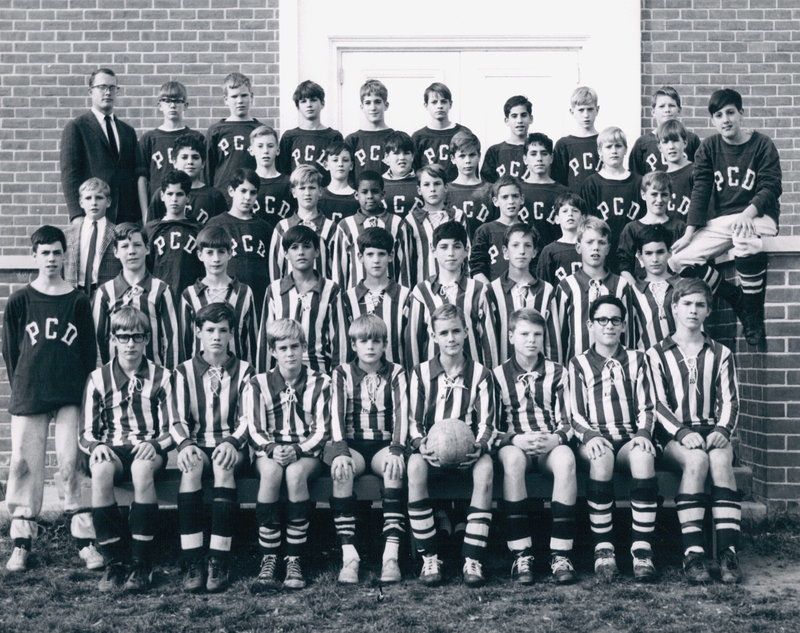 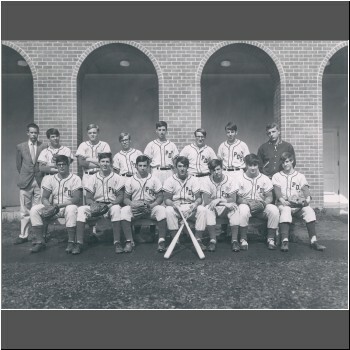 PDS 48 Boys Varsity Soccer Coaches (in suits on left) John Ivors and English/History Teacher Bob Miller PCD '51 are pictured with their team c. 1968. 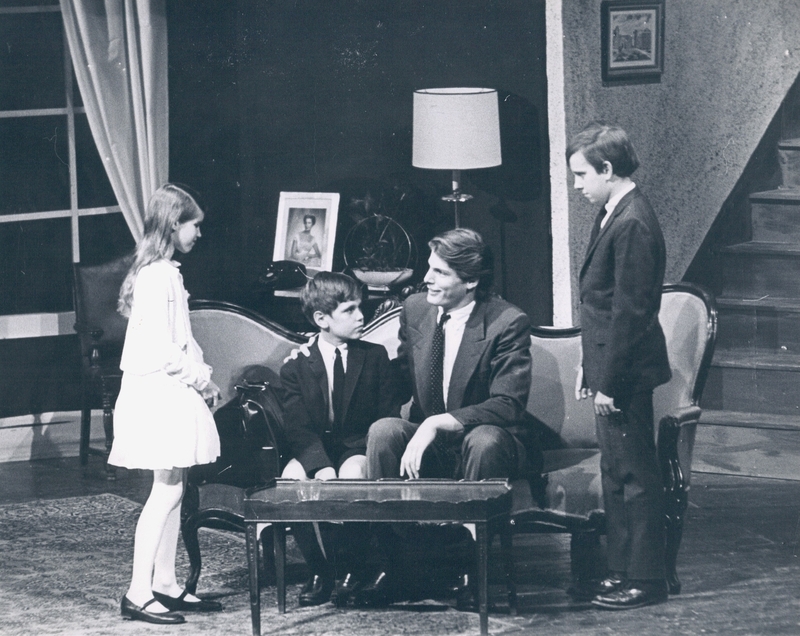 PDS 55 The cast of the 1969 production of Watch on the Rhine included (from left) Cintra Eglin '76, Davis Yokana '76, Chris Reeve '70 and Andrew Bonner '73. 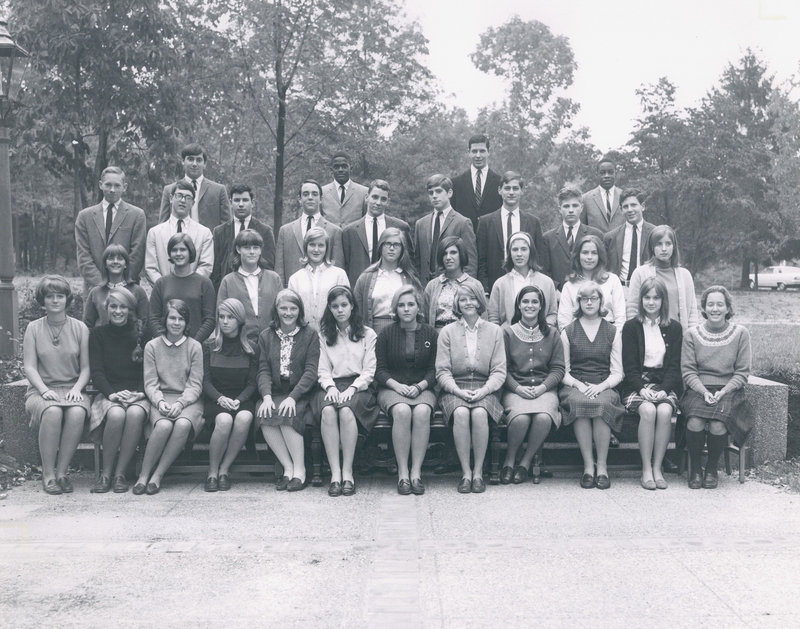 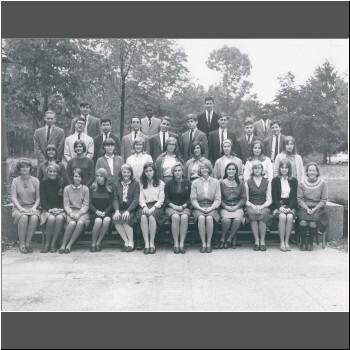 PDS 62 The 1966-1967 Spokesman staff: (first row) Susan Fritsch '67, Karen Meyers '67, Editor Betty Gilliam '67, Linda Fox '67, (back row) Susan Schnur '68, Punky Brewster '68, Chris Reeve '70, Beth Borgerhoff '69, Debbie Lawrence '70. 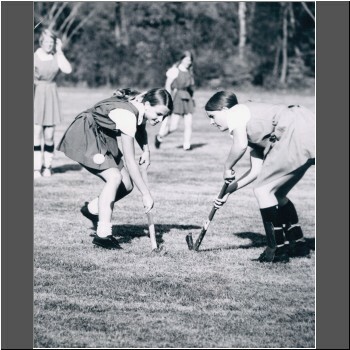 PDS 72 Kathy McClure '71 (left) fights for the ball. 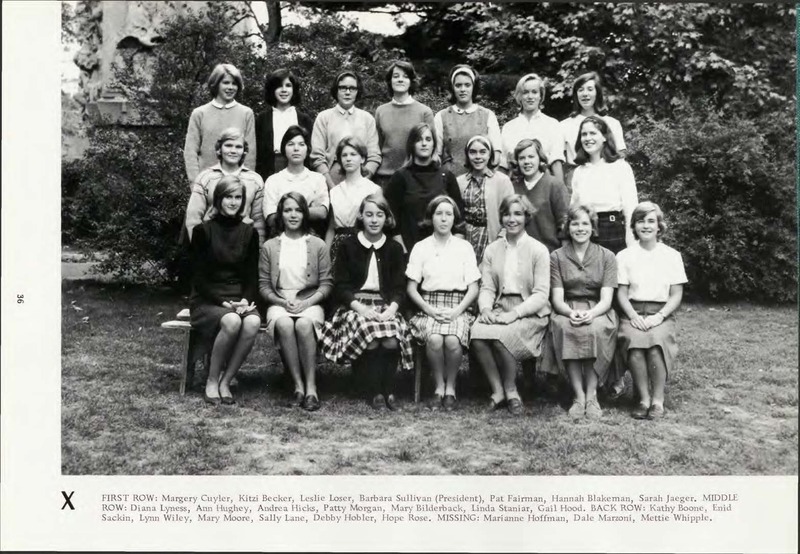 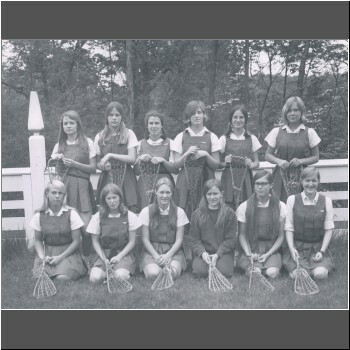 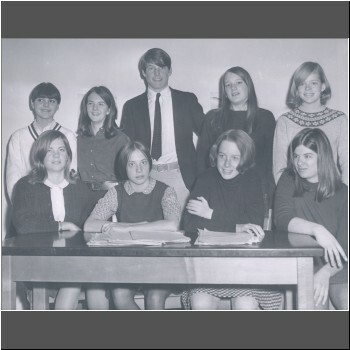 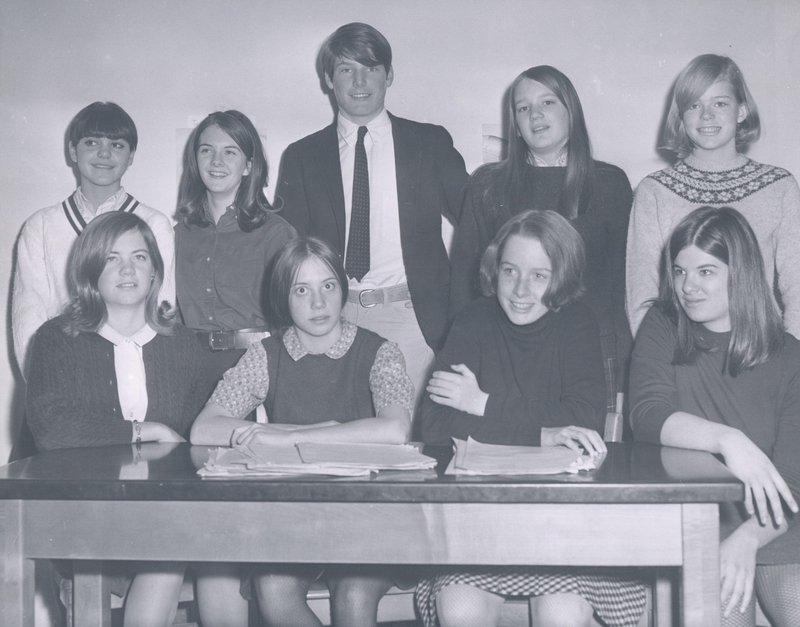 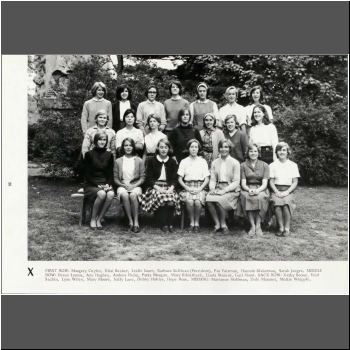 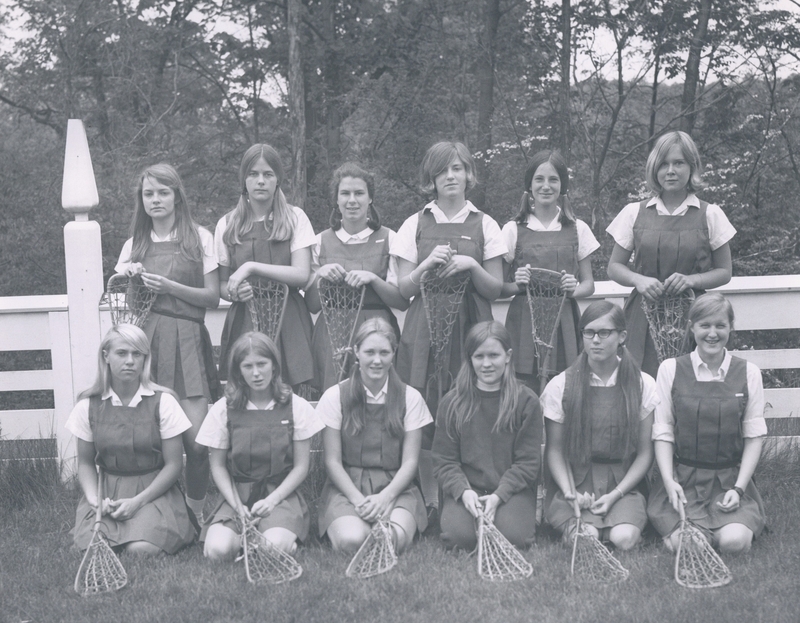 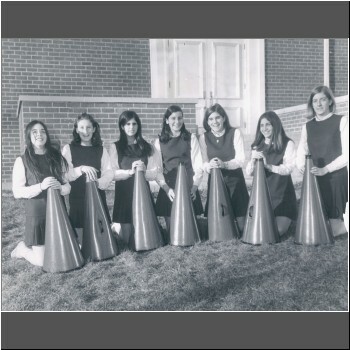 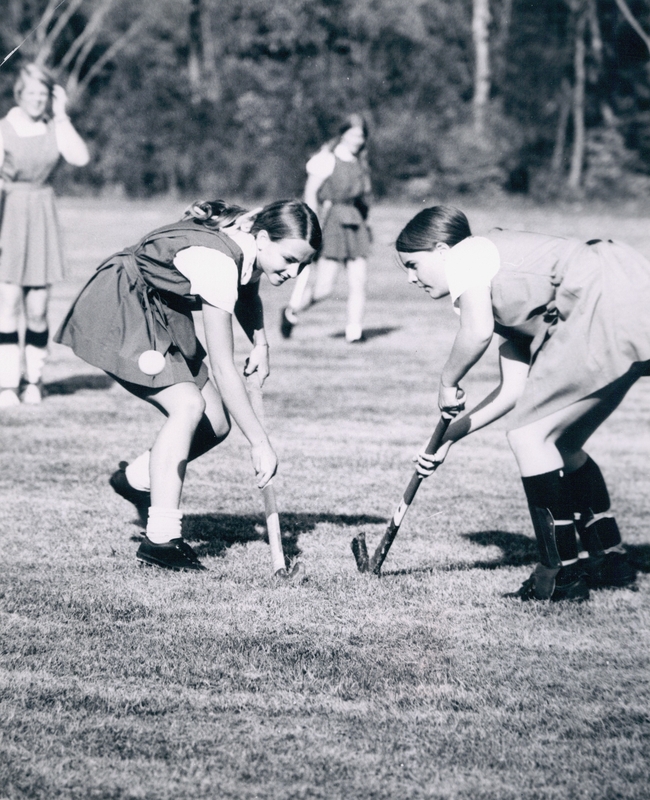 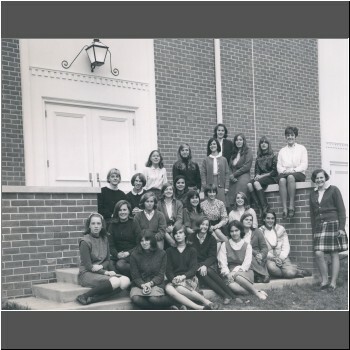 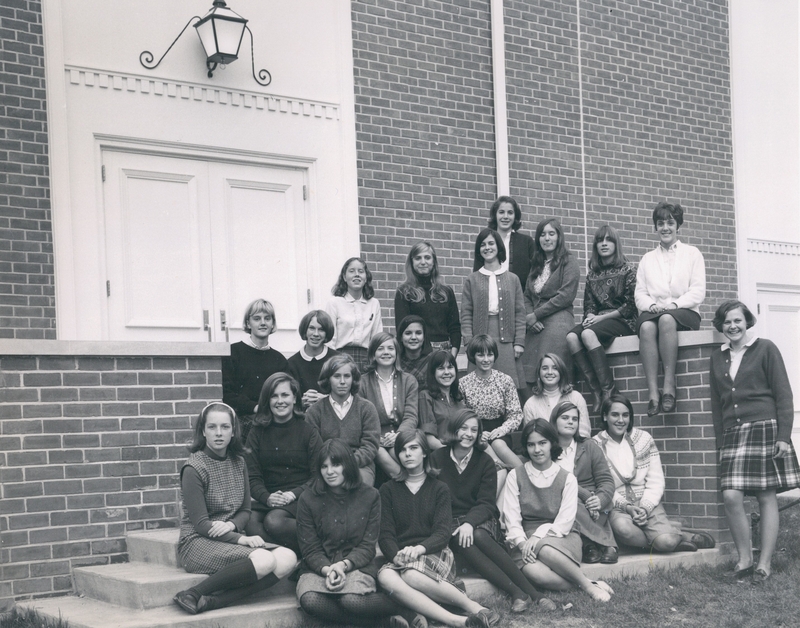 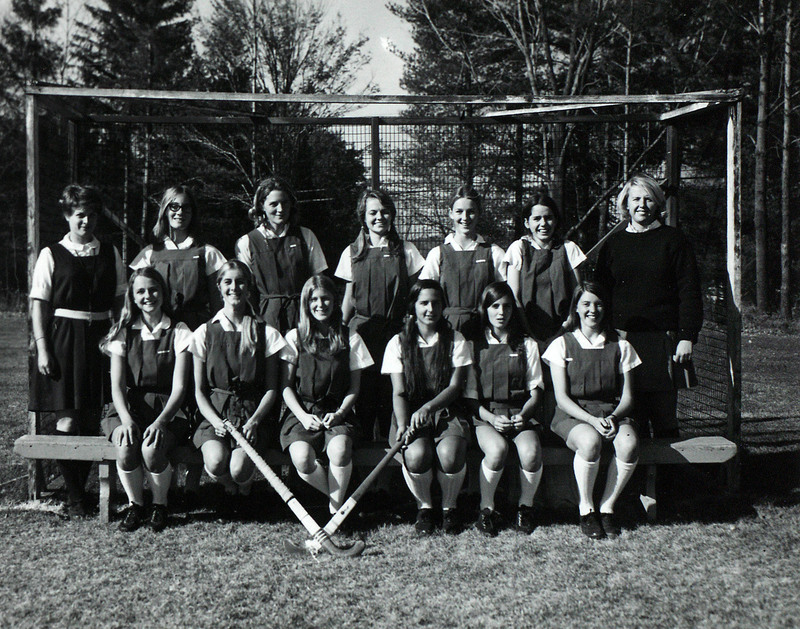 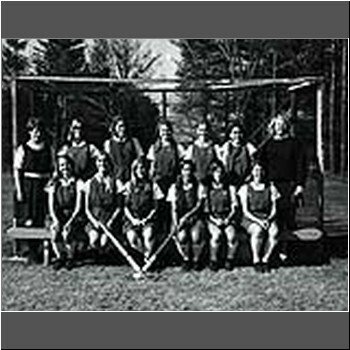 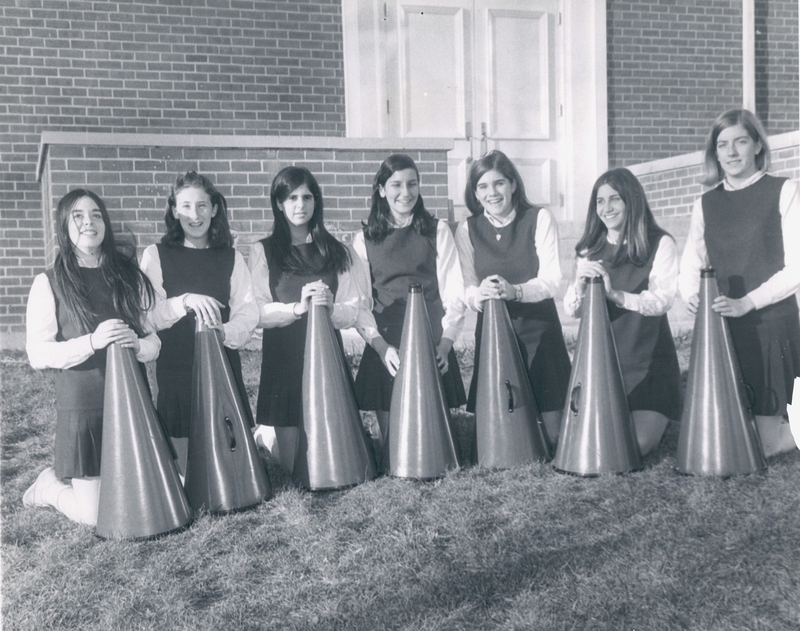 PDS 77 Coaches Vicky Dean (back, far left) and Athletic Director Jan Baker (far right) with the 1970 varsity field hockey team. 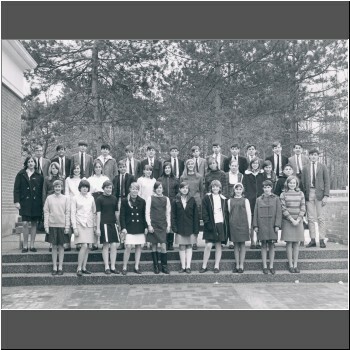 PDS 154 1967-1968 Cheerleaders include Freddie Cagan, Candy Boyajian, Ebbie Rose, Jane Wiley, Ronda Davis, Harriet Sharlin, Beth Healy. 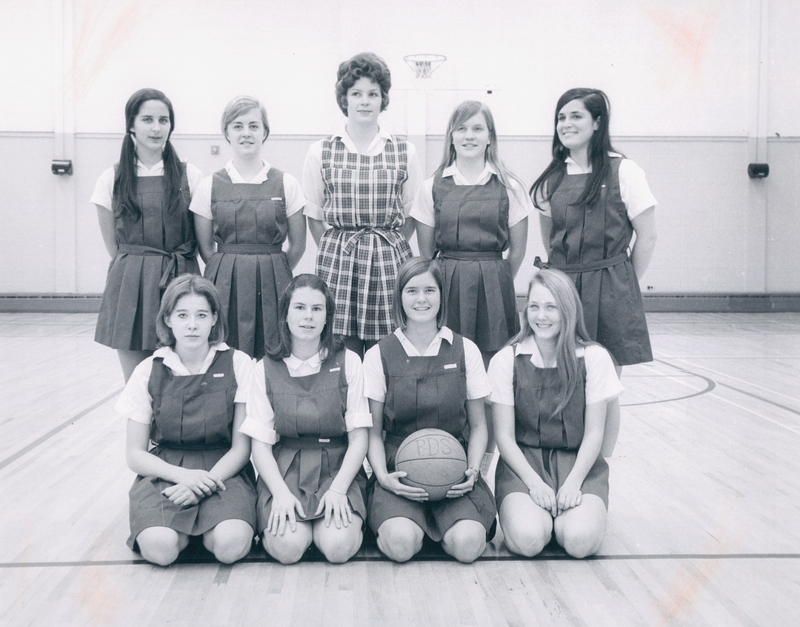 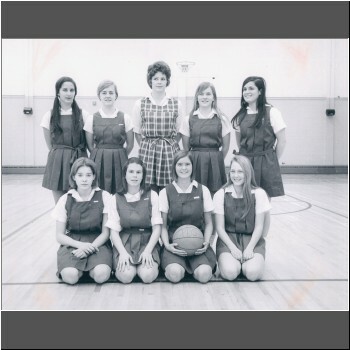 PDS 155 Ann Penny coached this 1967-1968 girls varsity basketball team. 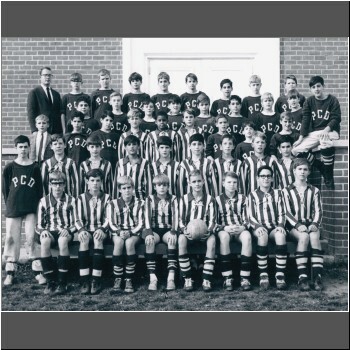 PDS 157 Mr. Hillman (top, left) coached this boys junior soccer team in c.1967. 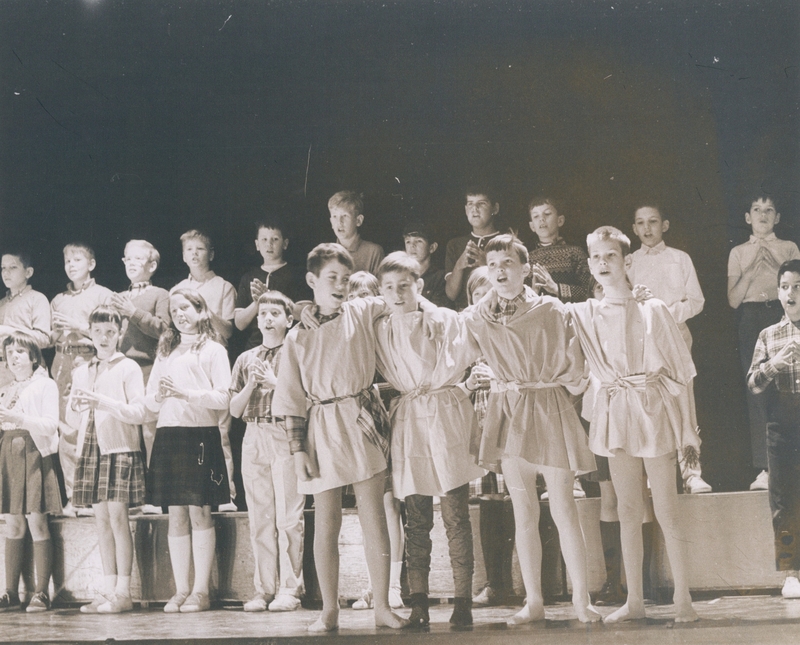 PDS 158 The Lower School presented Aesop's Fables in 1966. 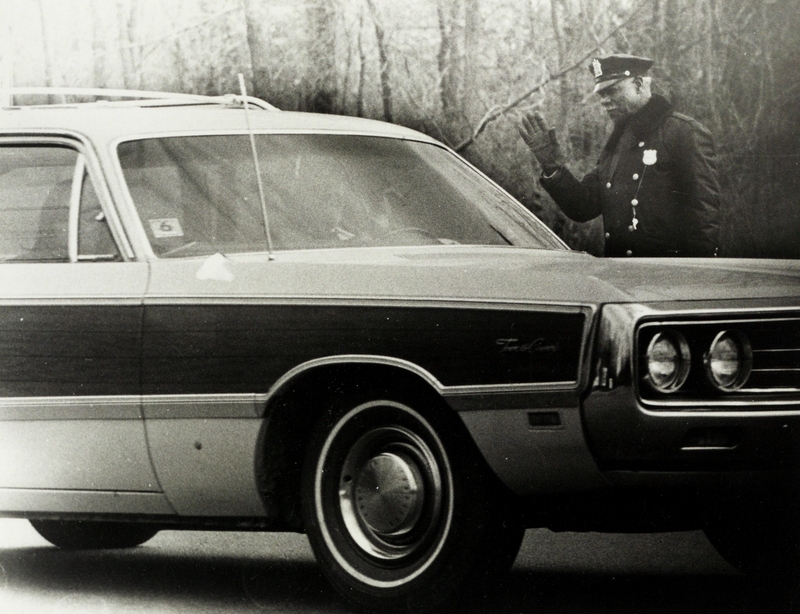 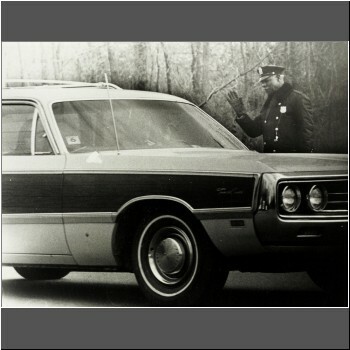 PDS 159 Junior Thomas kept traffic moving at MFS and then at PDS. 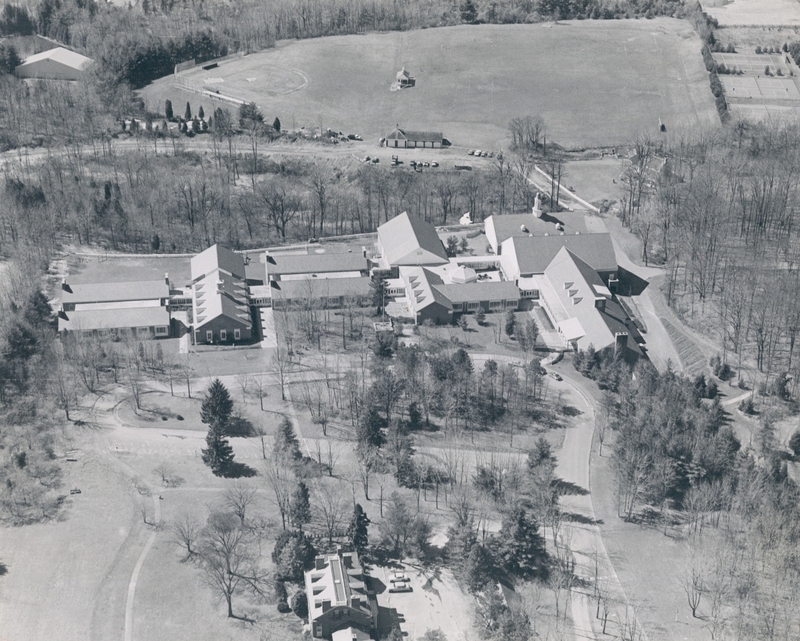 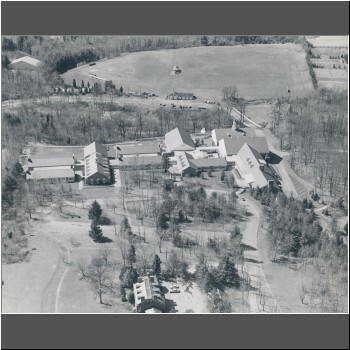 PDS 213 An aerial view of the campus in the late 1960s. 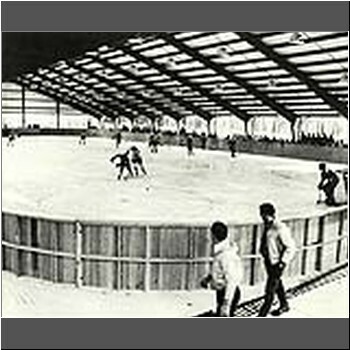 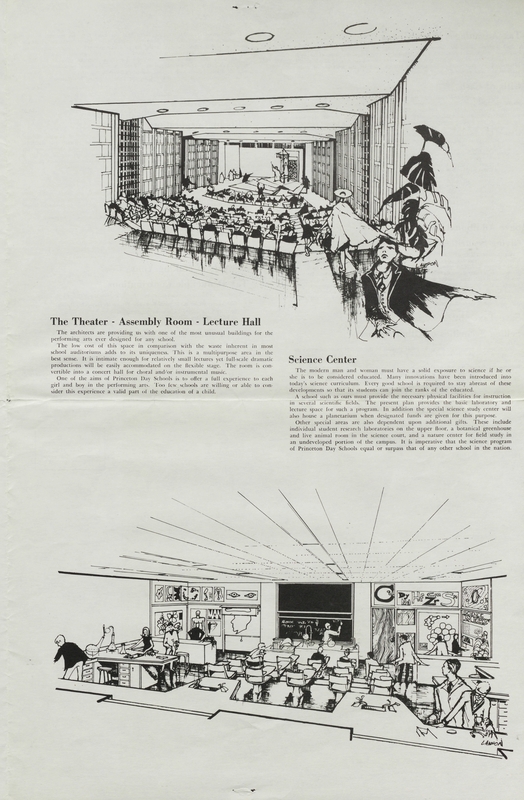 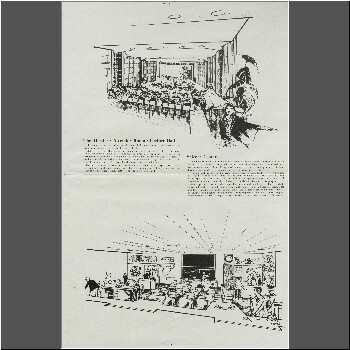 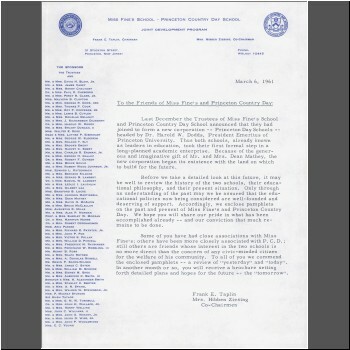 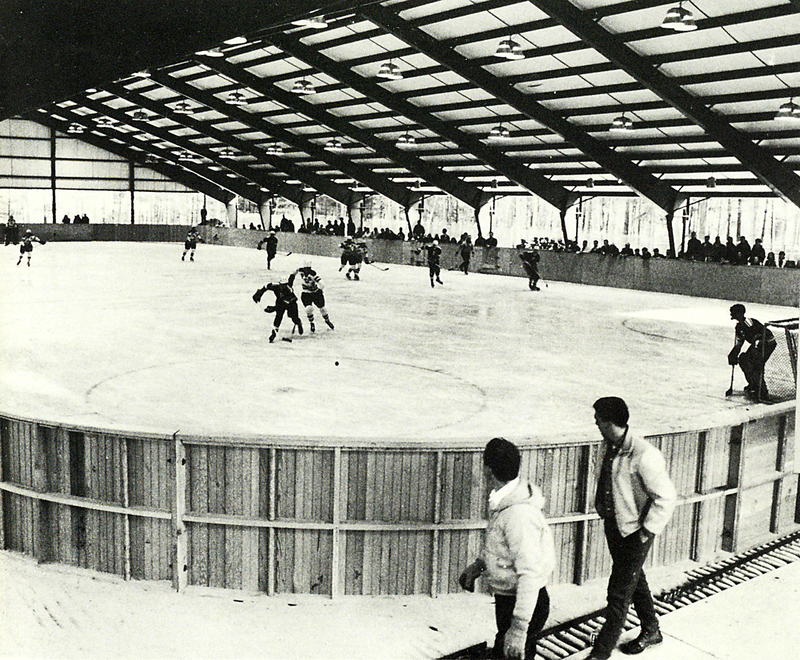 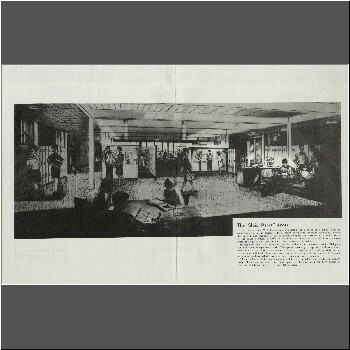 PDS 277 In January 1967, the first PDS rink opened. 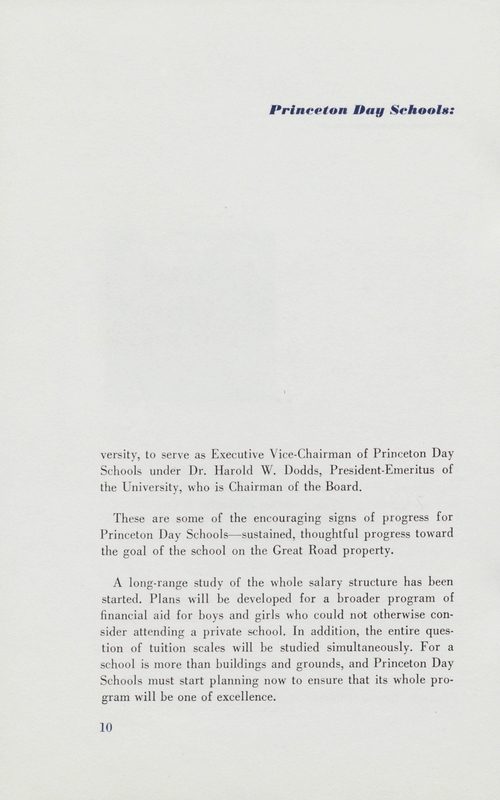 It was covered but open on both sides. 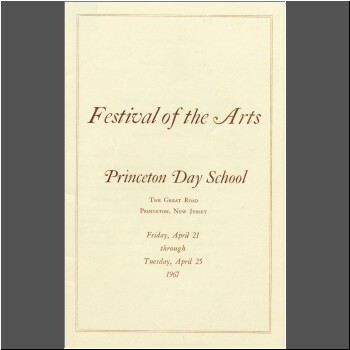 PDS 284 Our Town, the first PDS dramatic production was presented in November 1965. 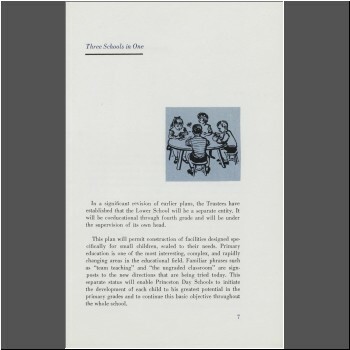 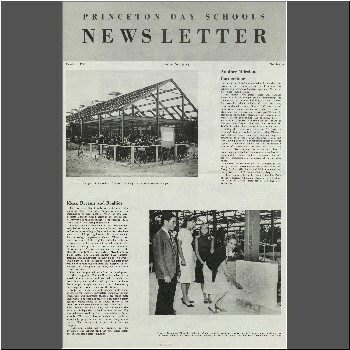 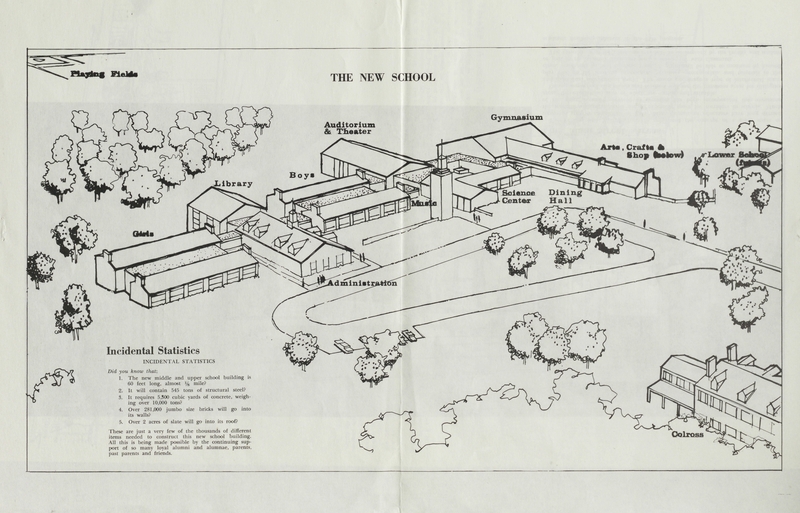 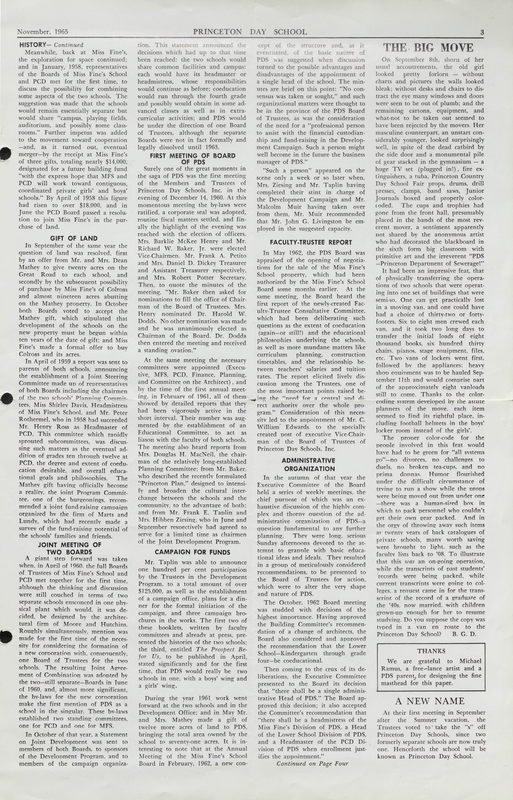 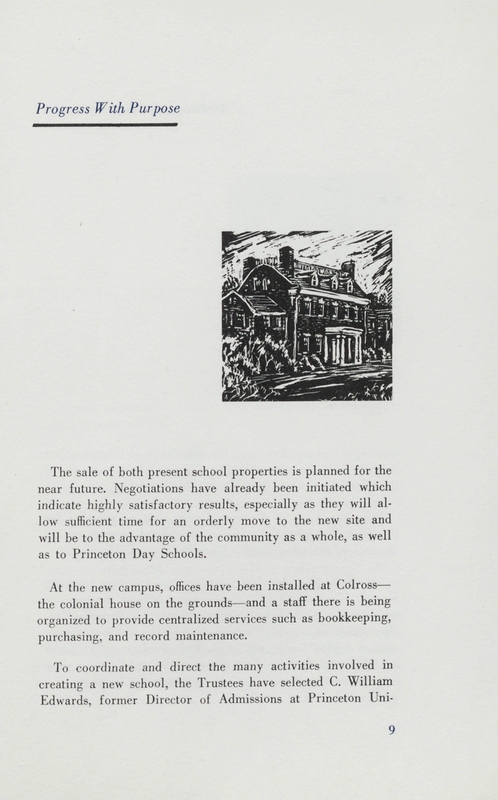 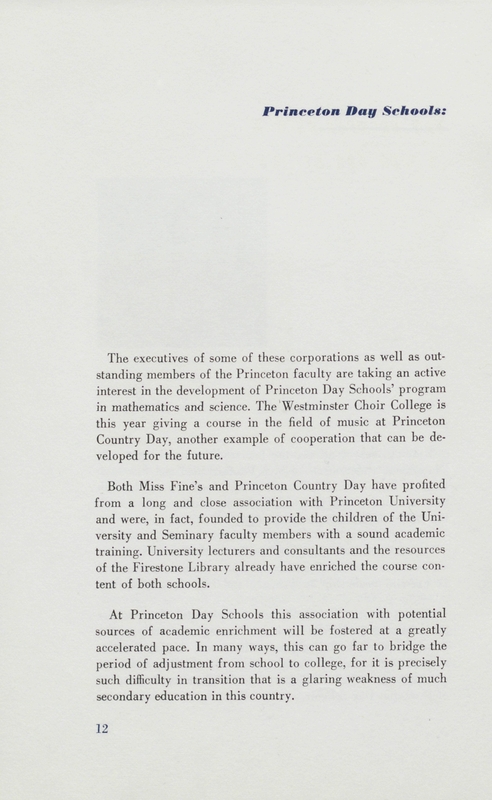 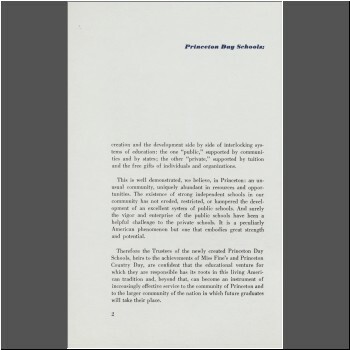 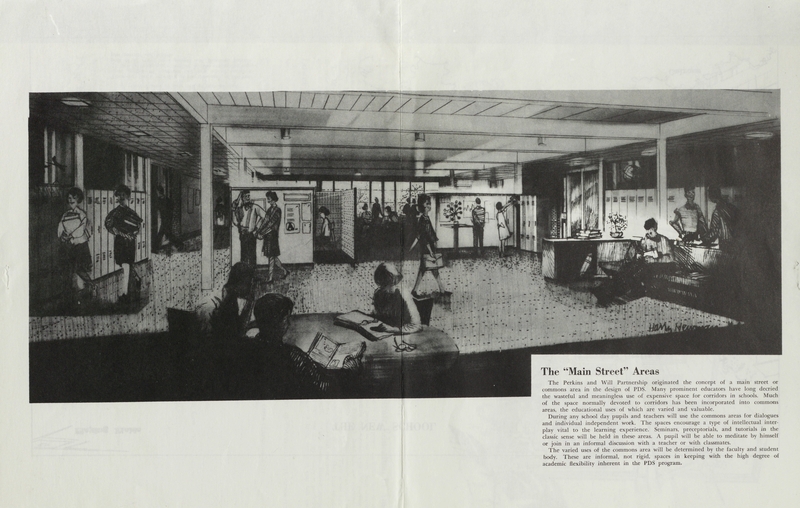 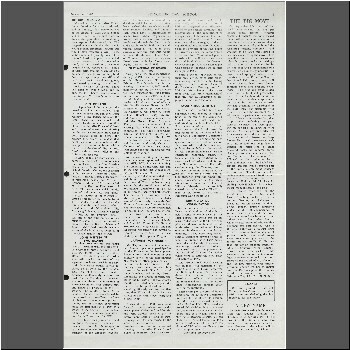 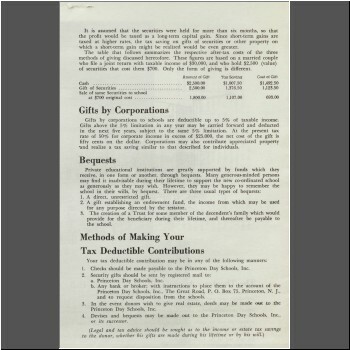 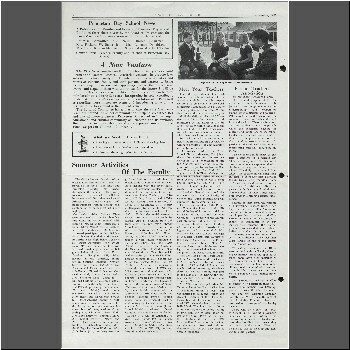 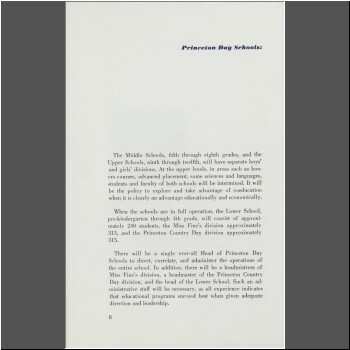 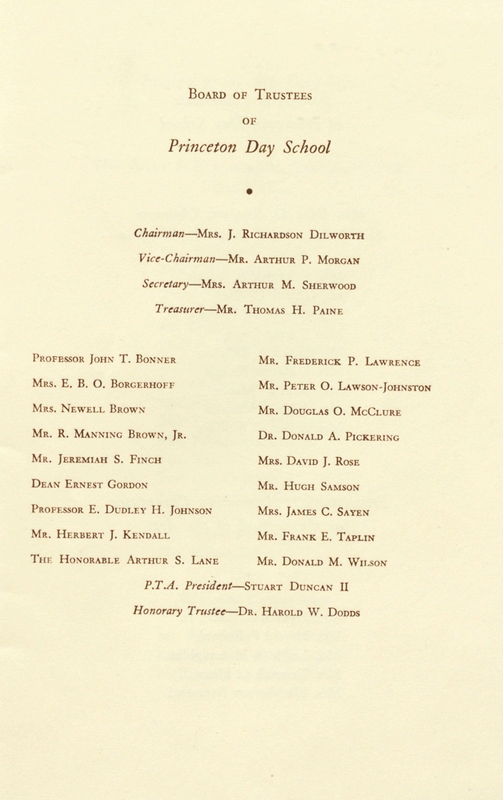 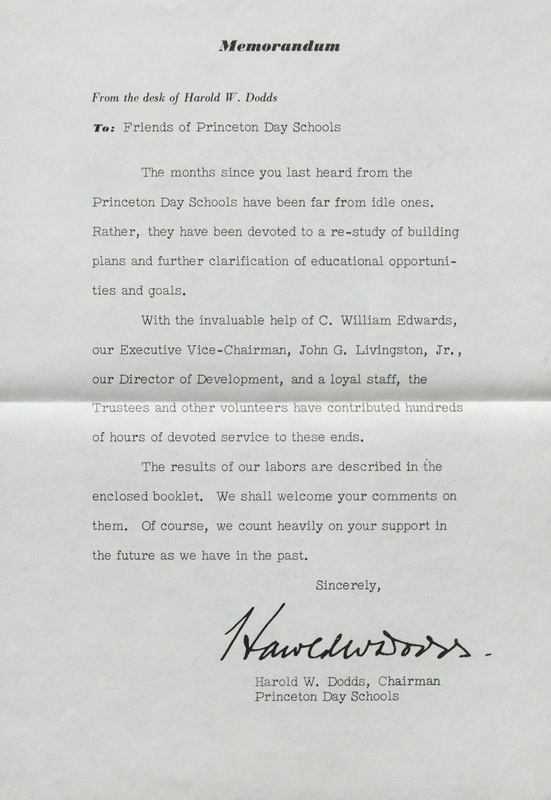 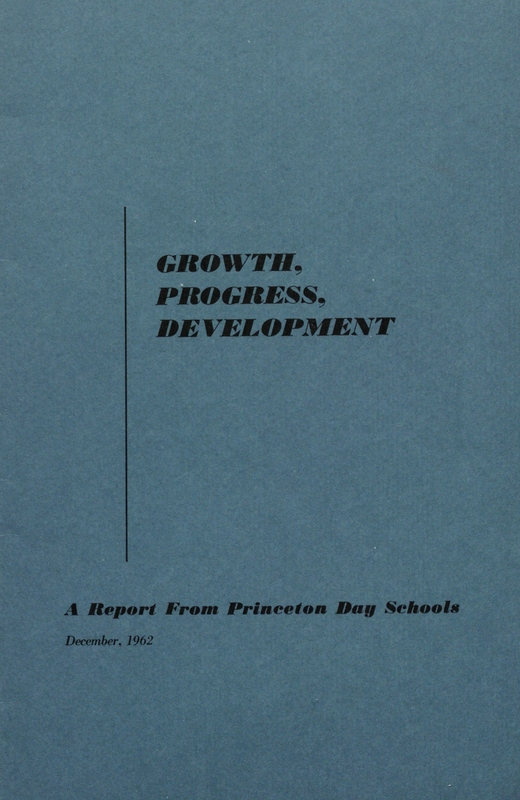 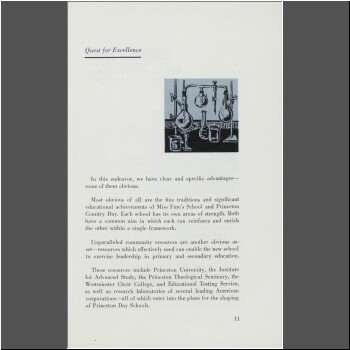 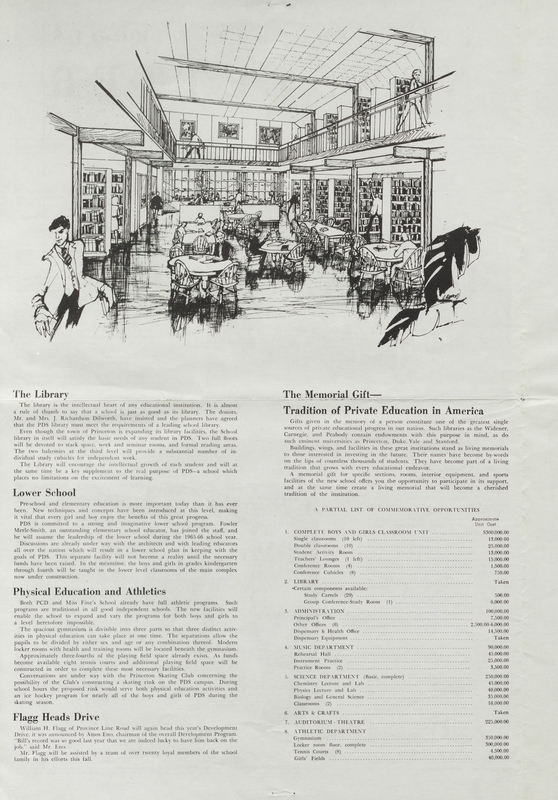 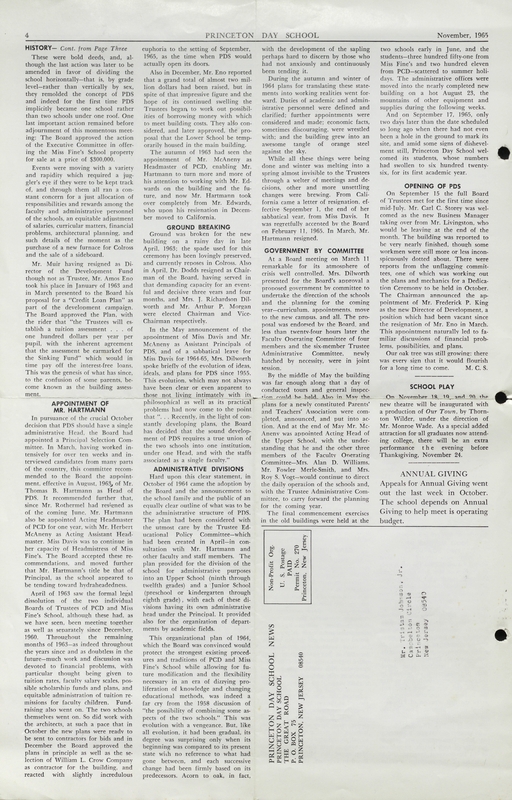 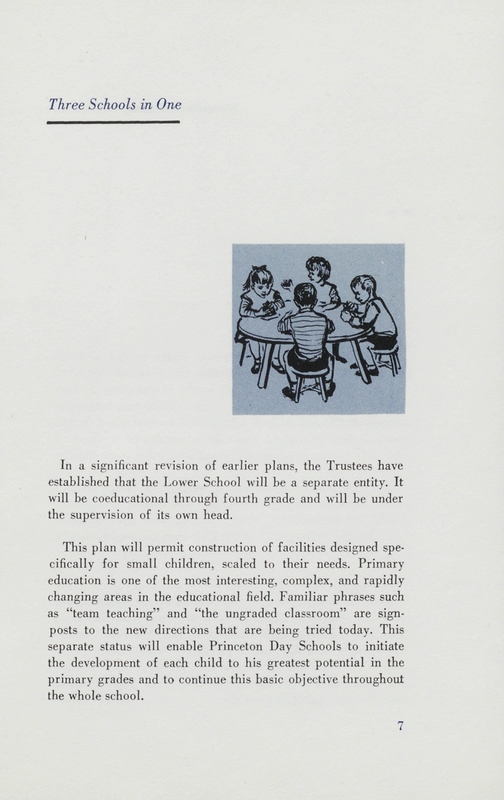 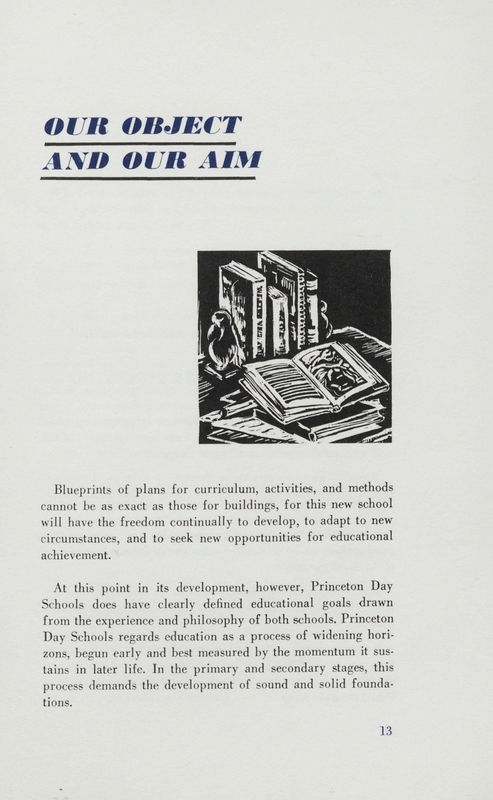 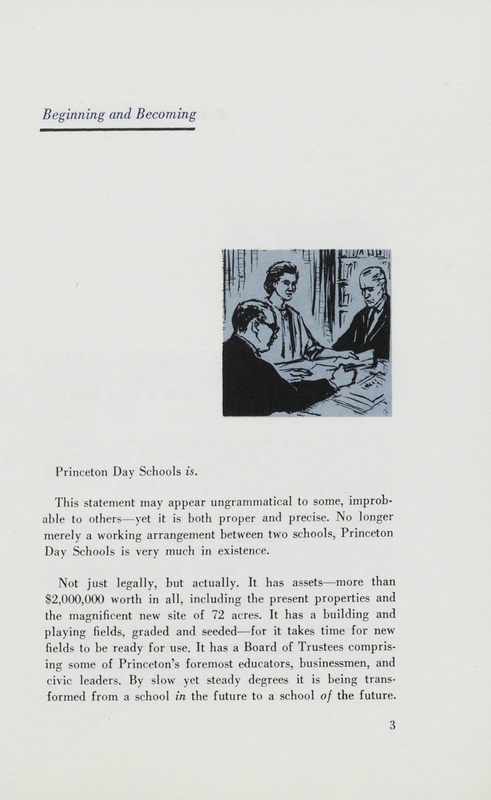 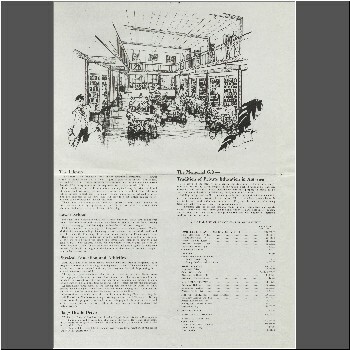 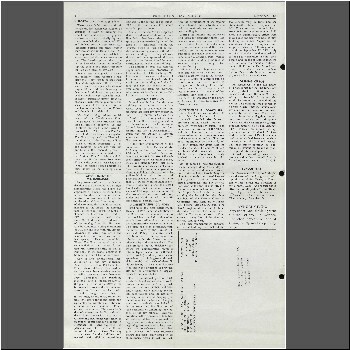 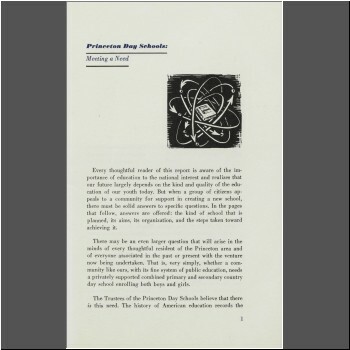 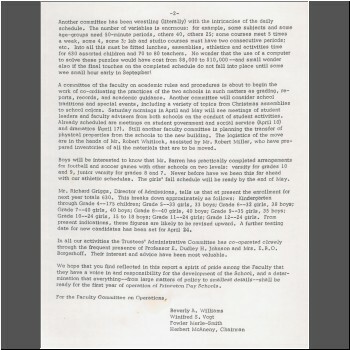 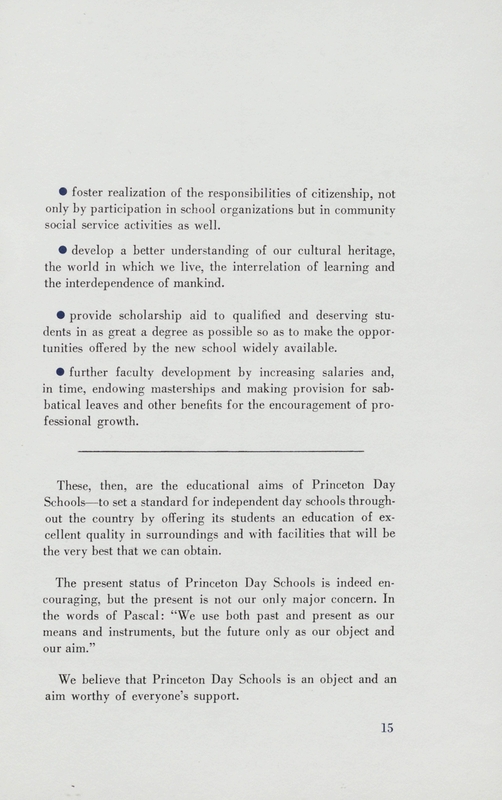 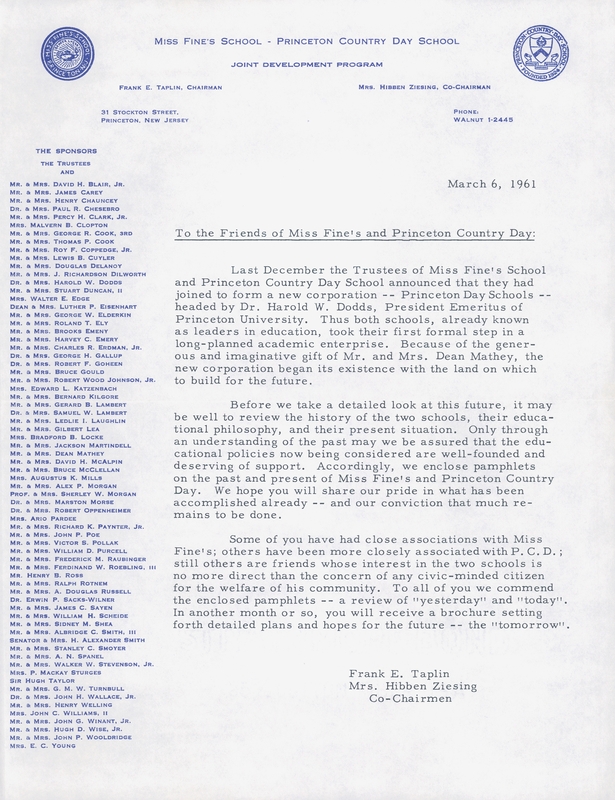 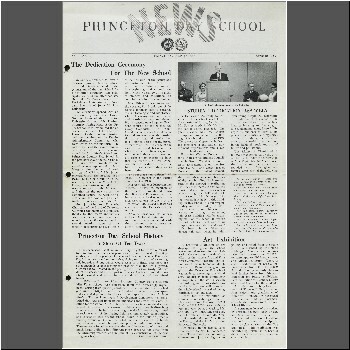 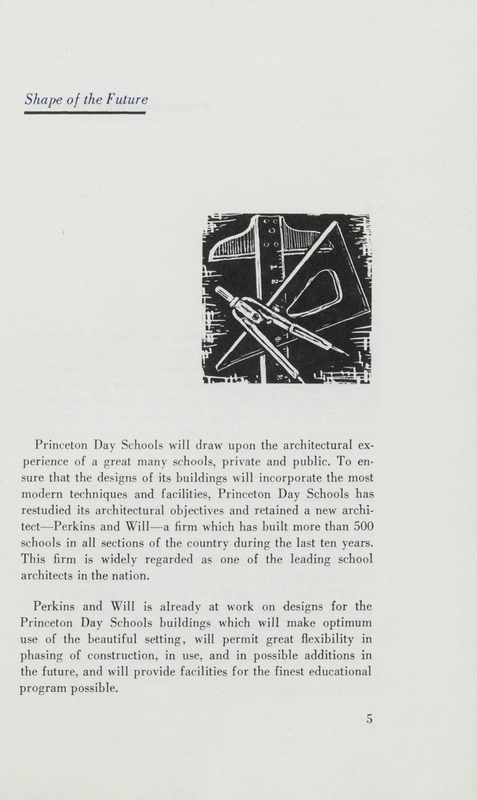 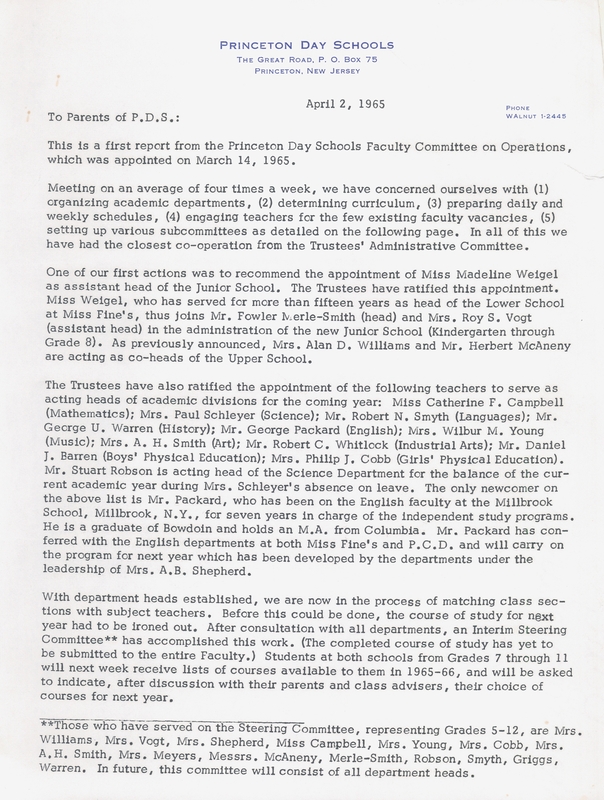 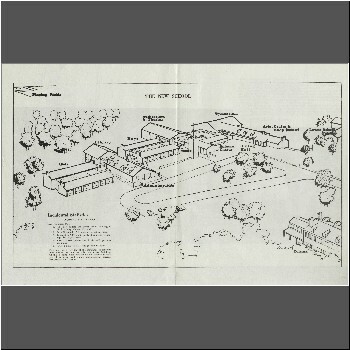 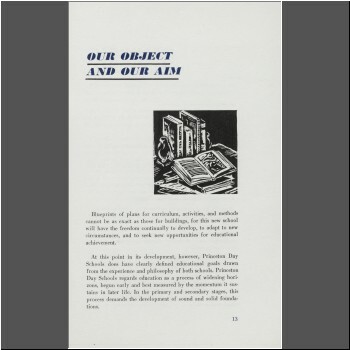 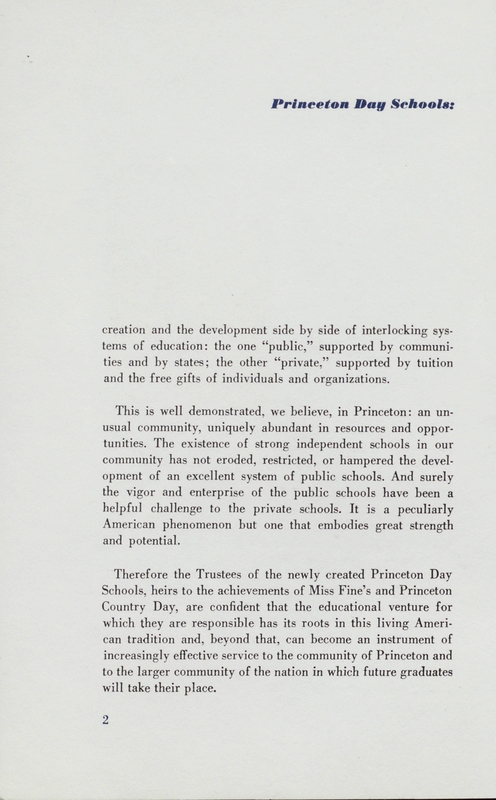 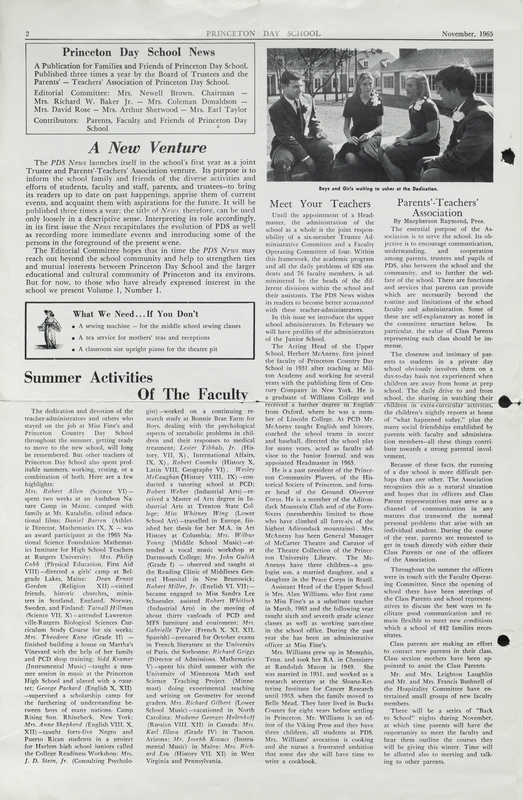 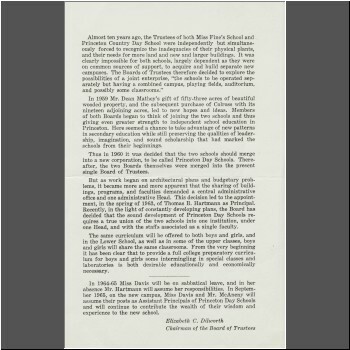 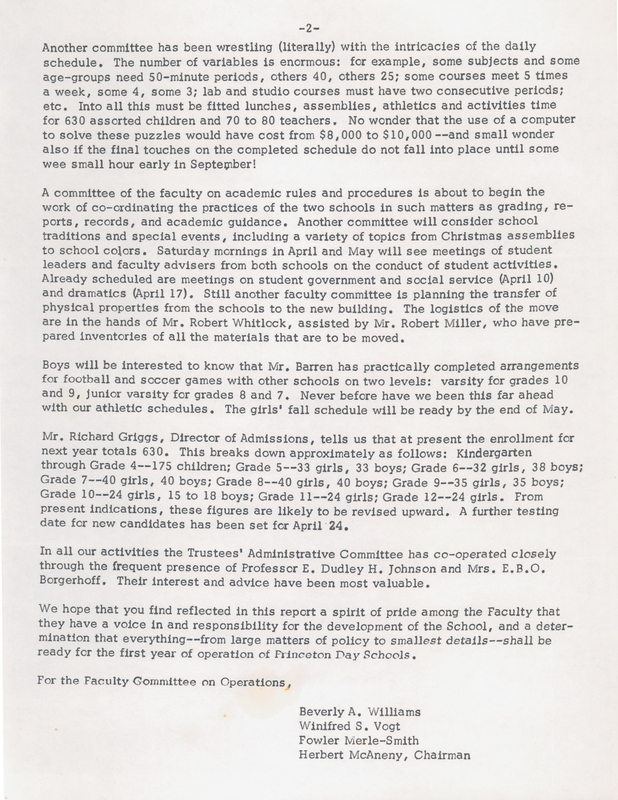 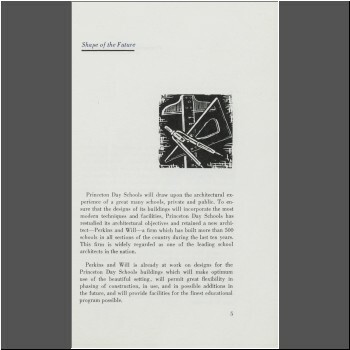 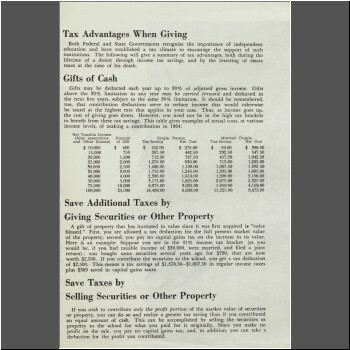 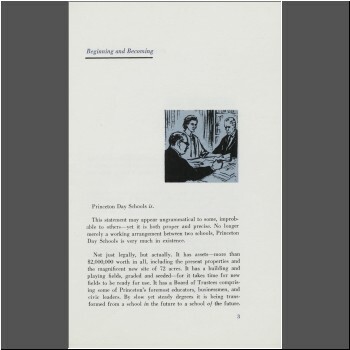 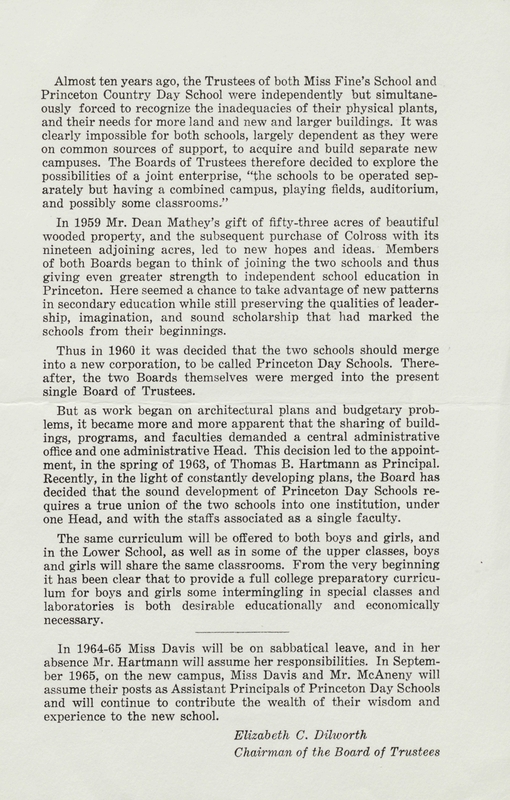 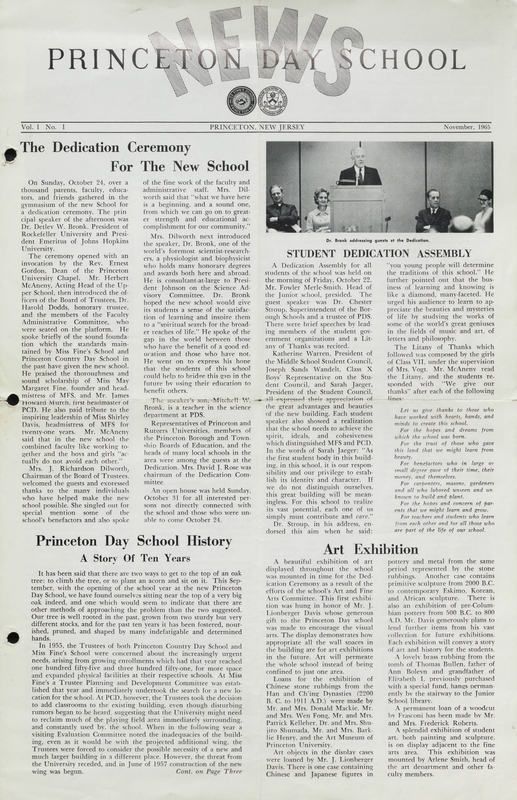 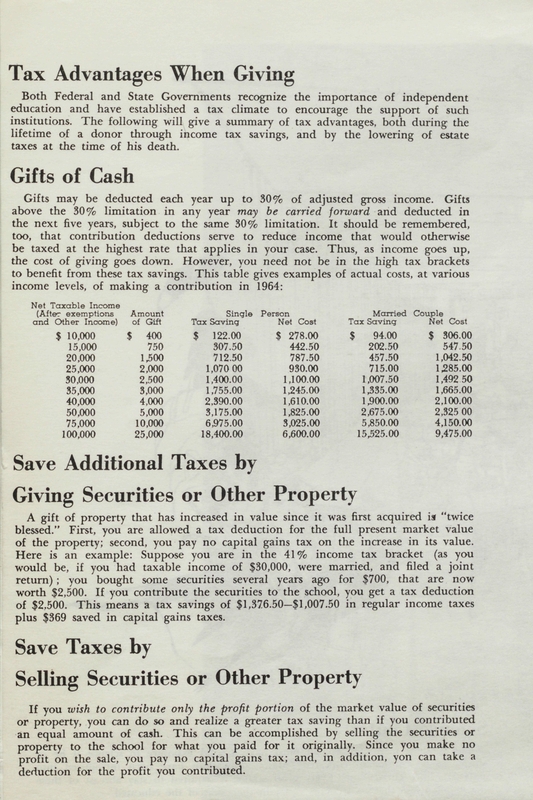 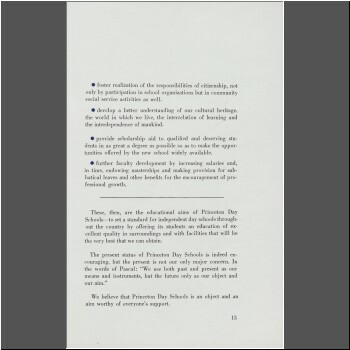 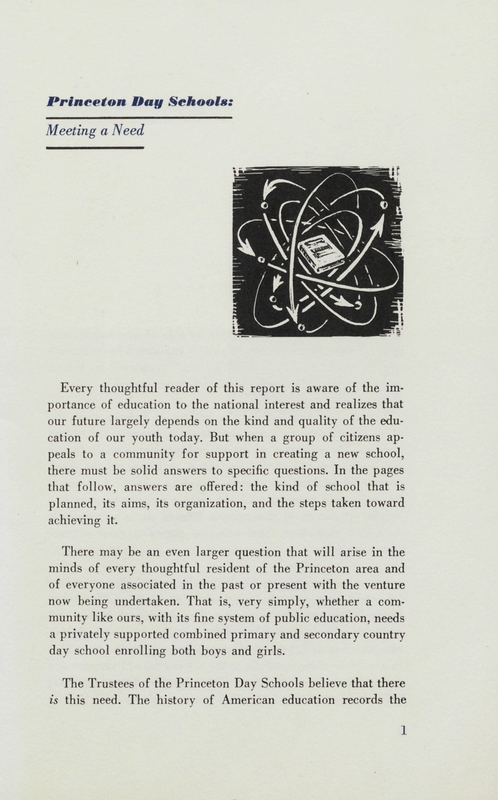 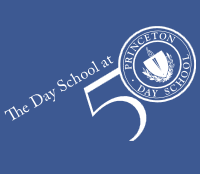 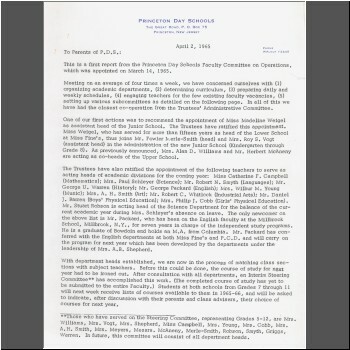 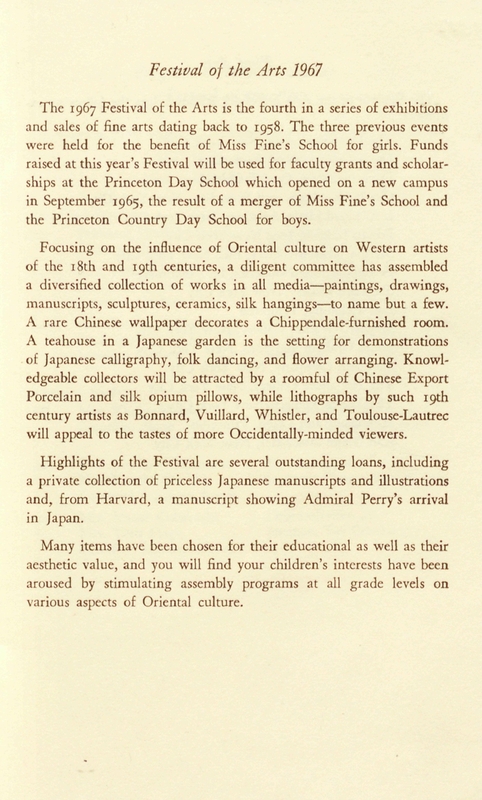 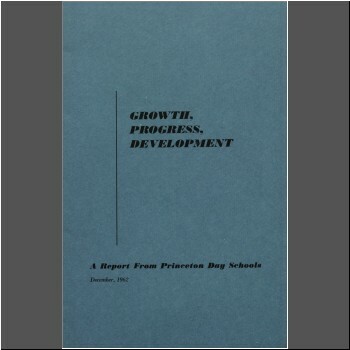 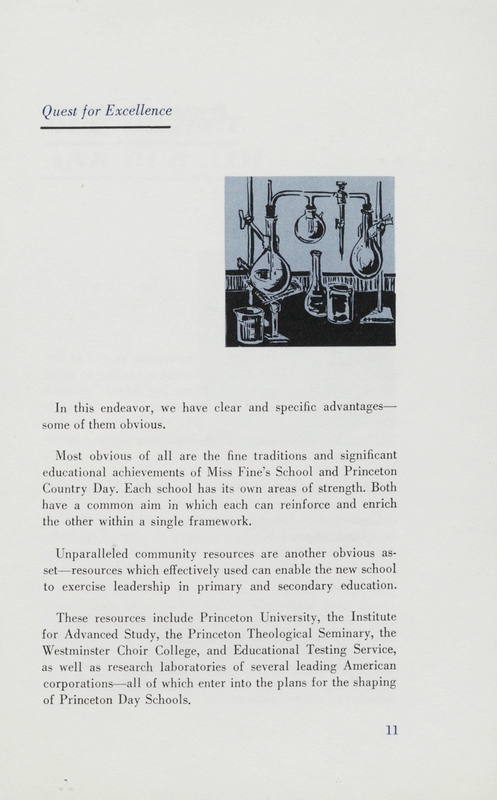 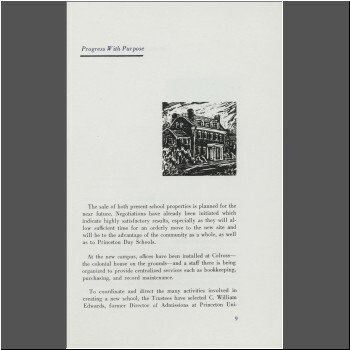 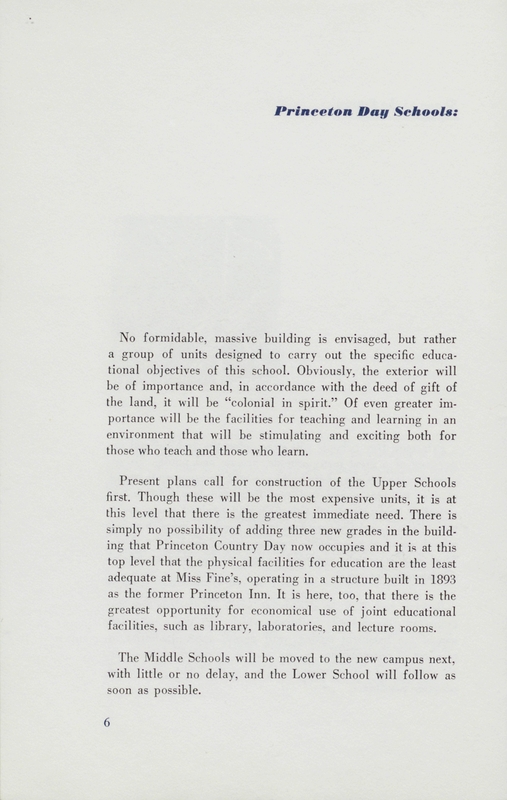 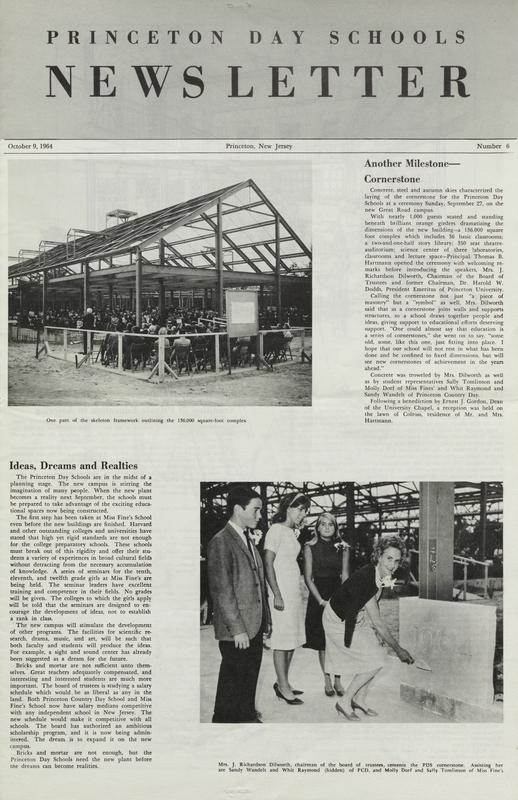 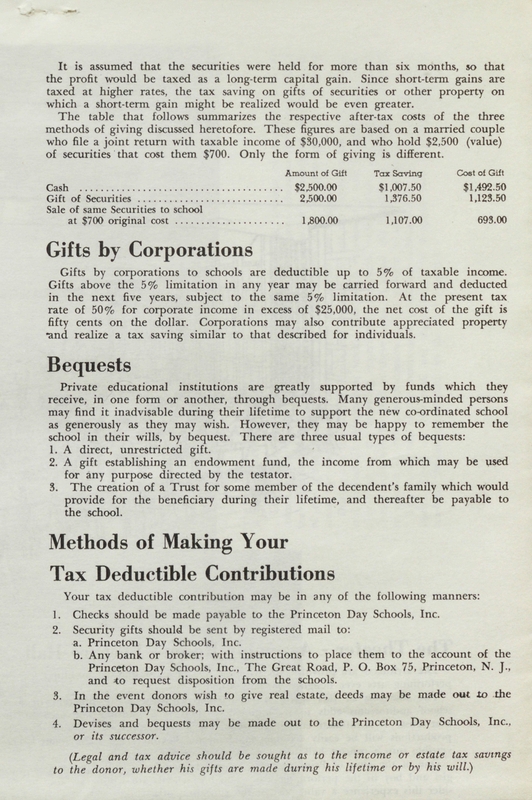 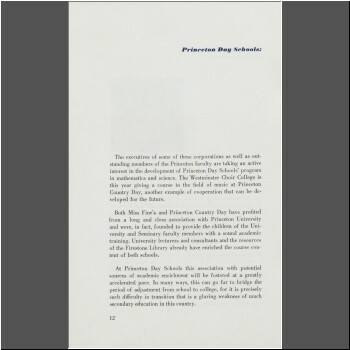 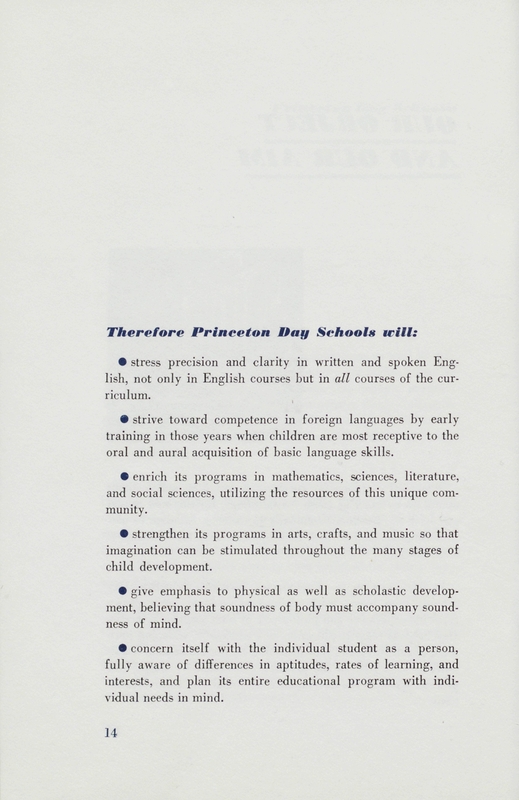 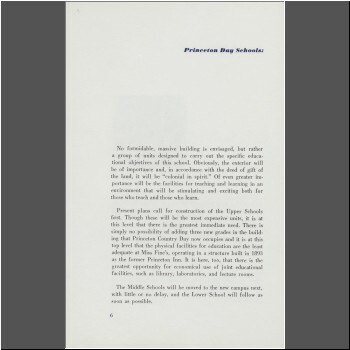 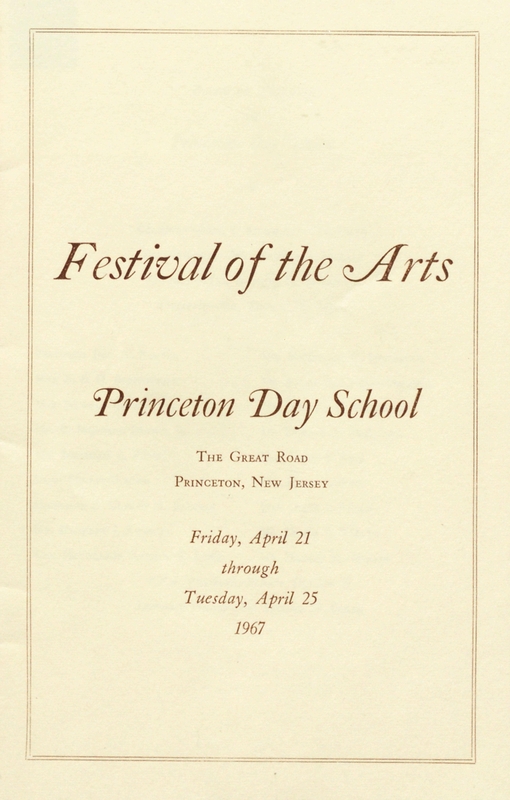 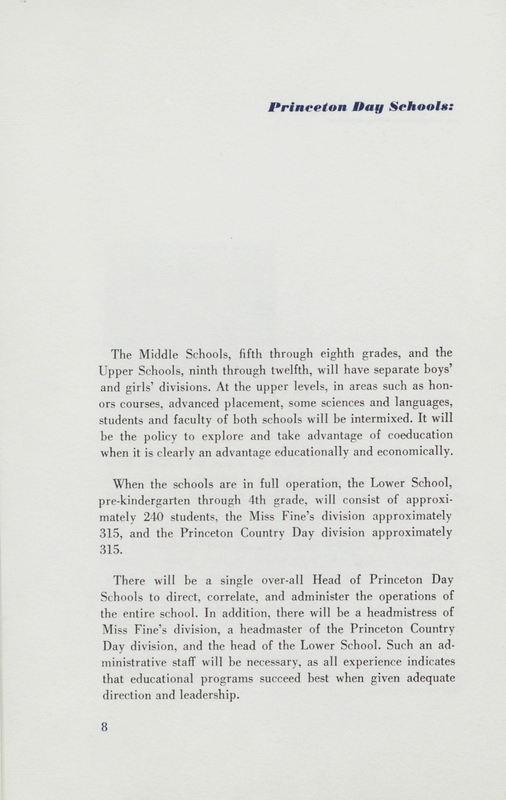 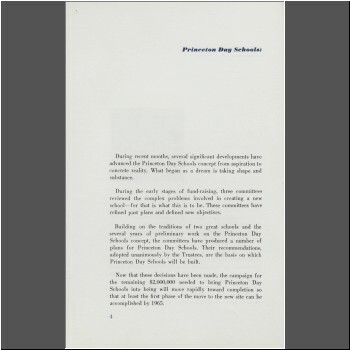 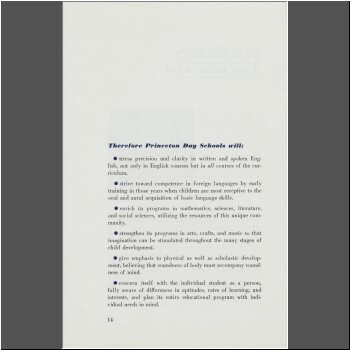 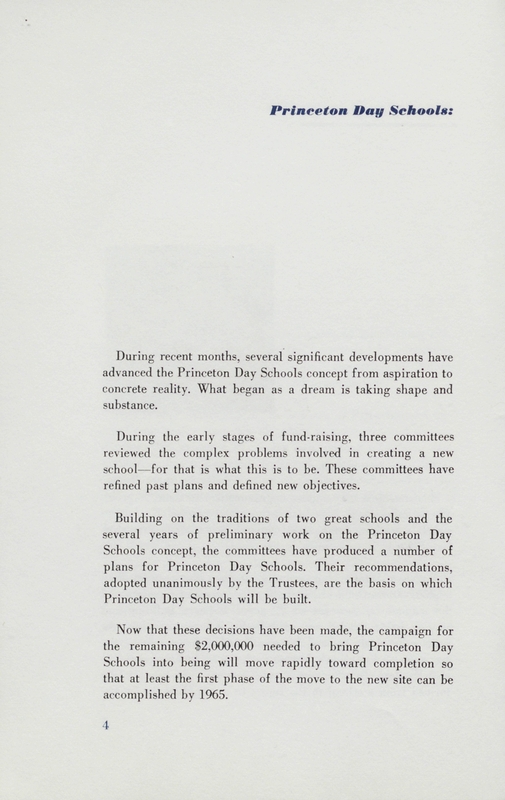 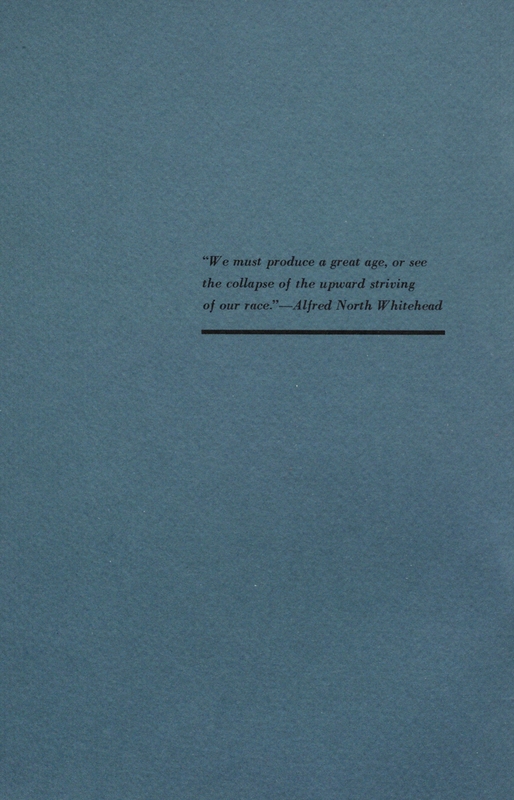 PDS 285 The first edition of the Princeton Day School News, published in November 1965.